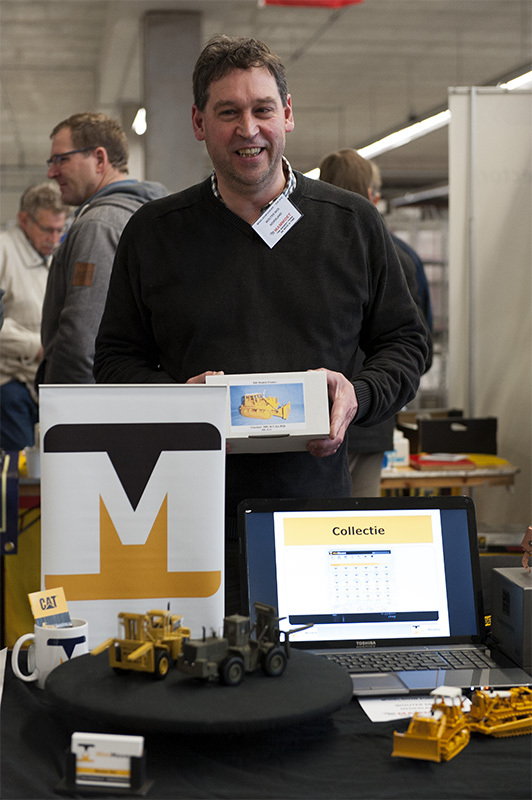 Saturday, March 19, 2016 the 25st Modelshow Europe was held in the flowerauction "Plantion" nearby the city Ede in the Netherlands. 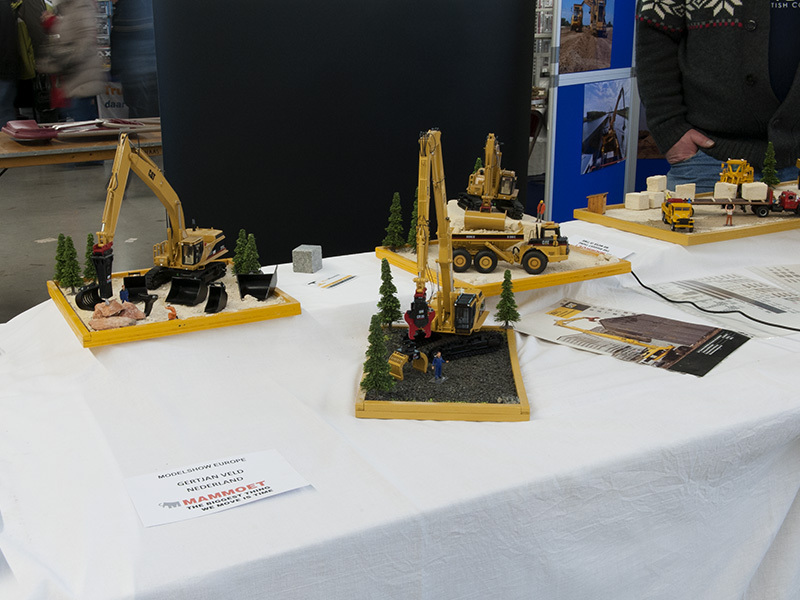 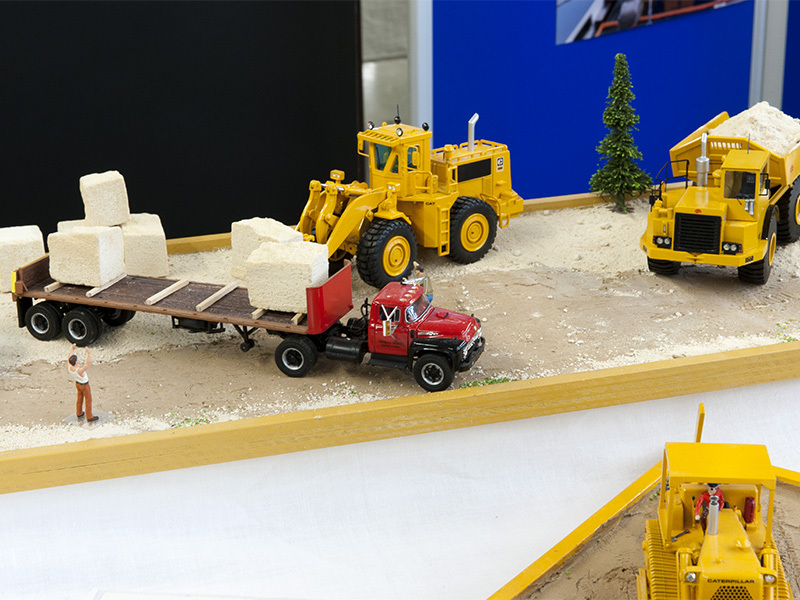 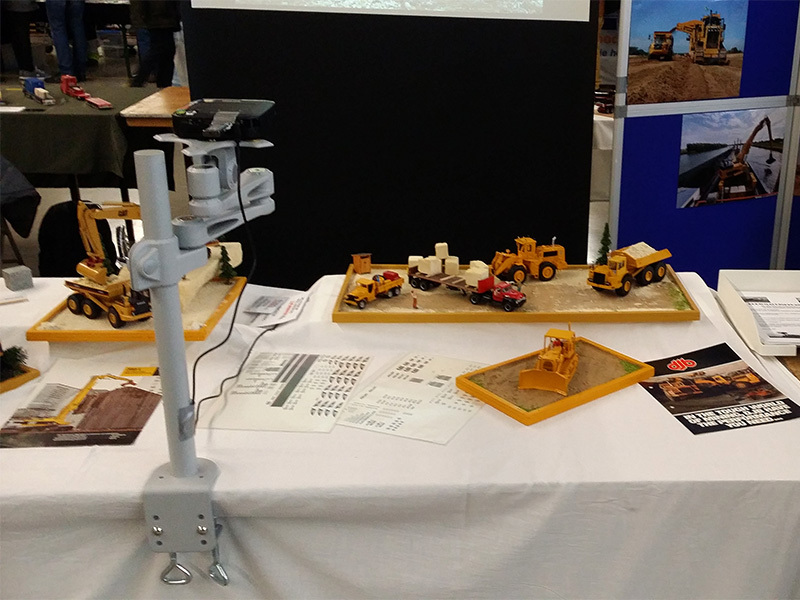 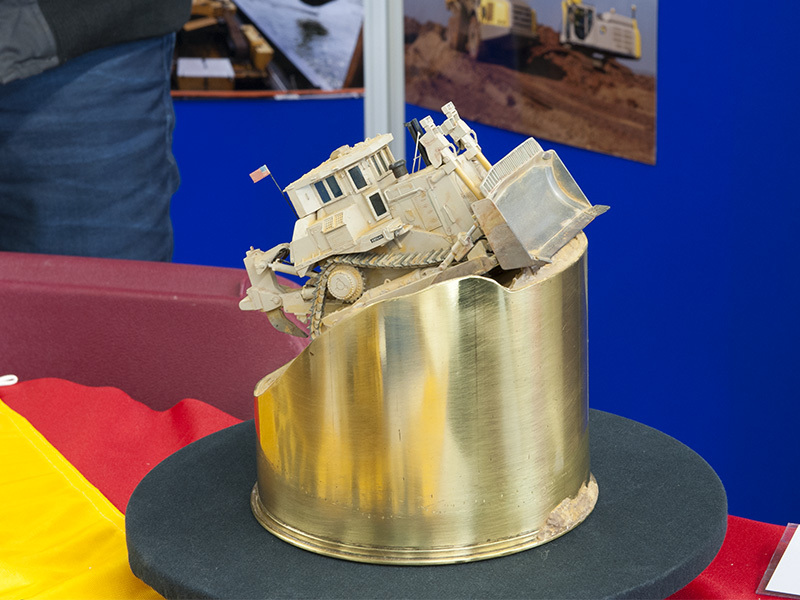 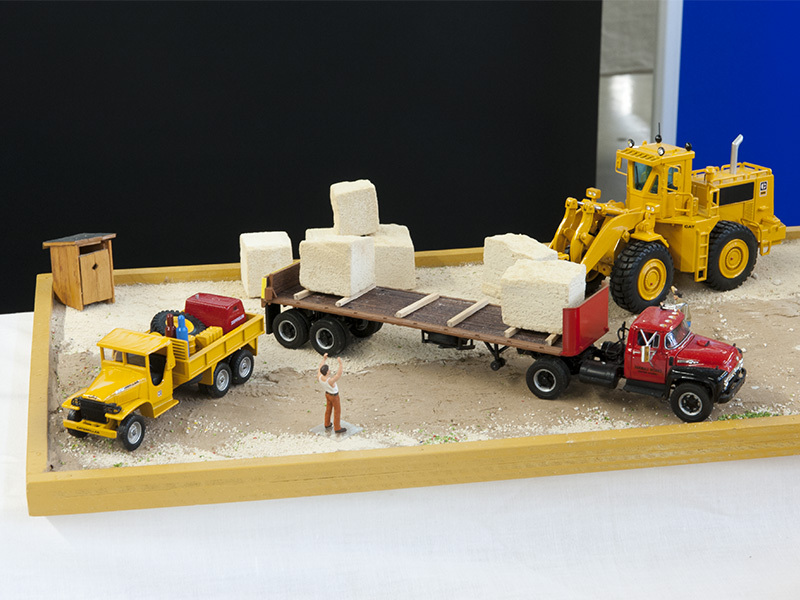 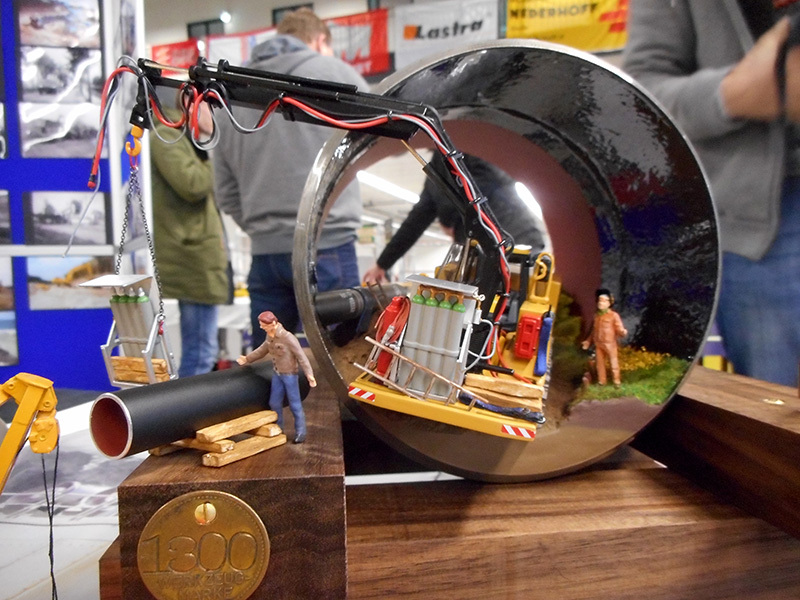 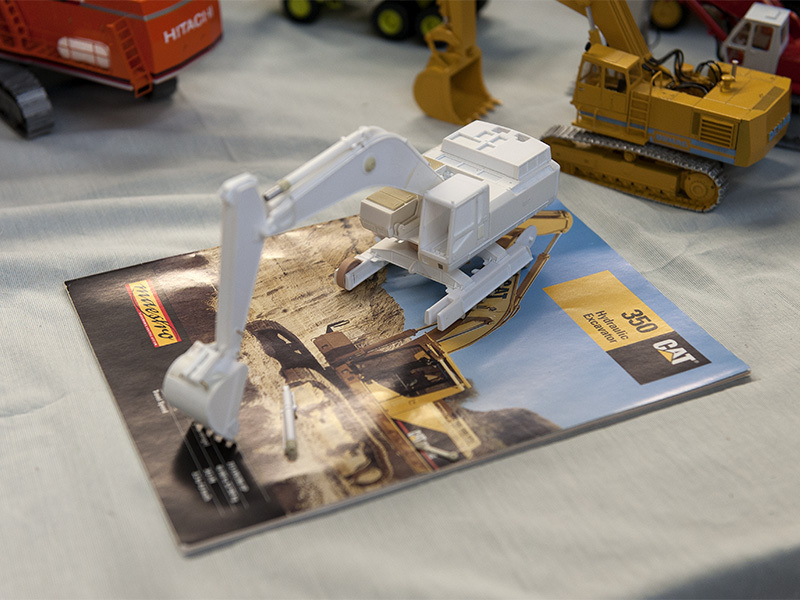 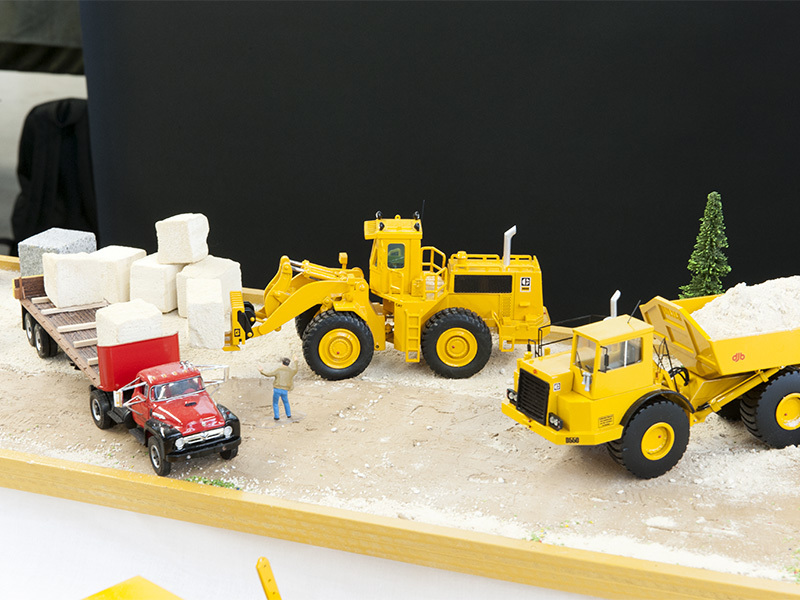 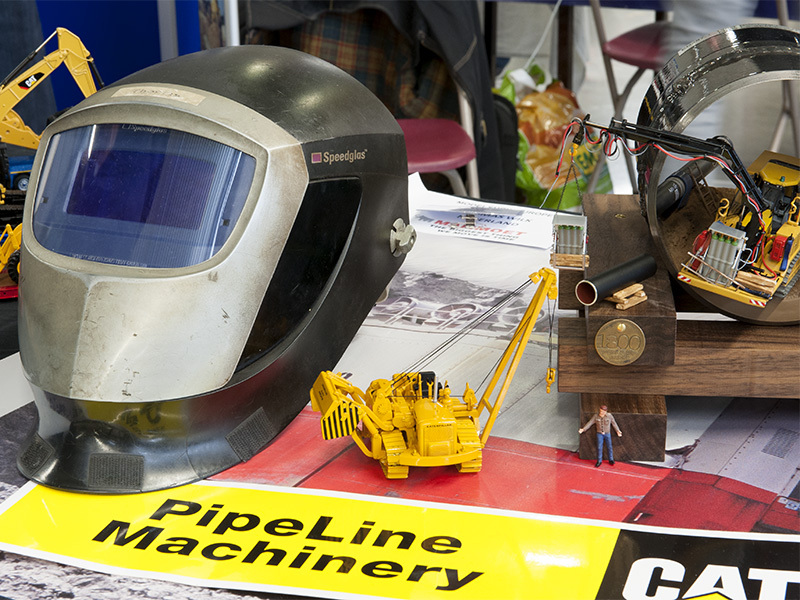 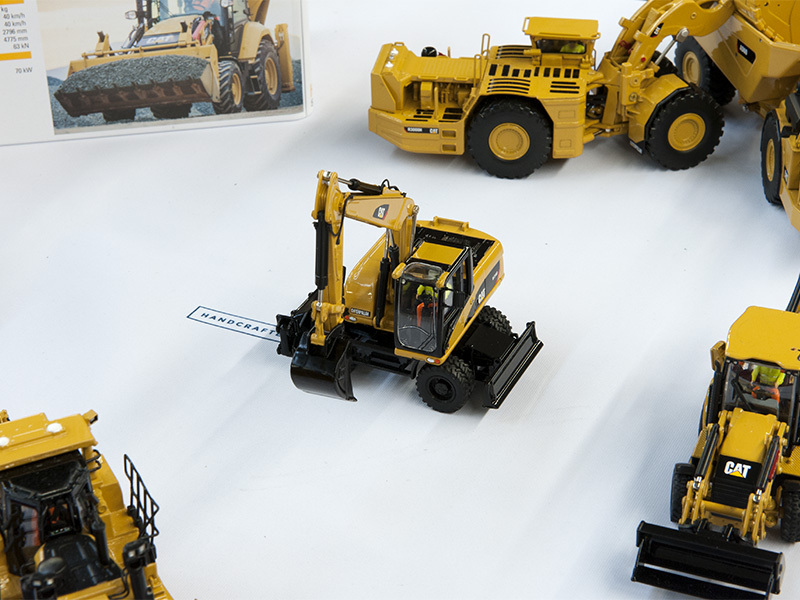 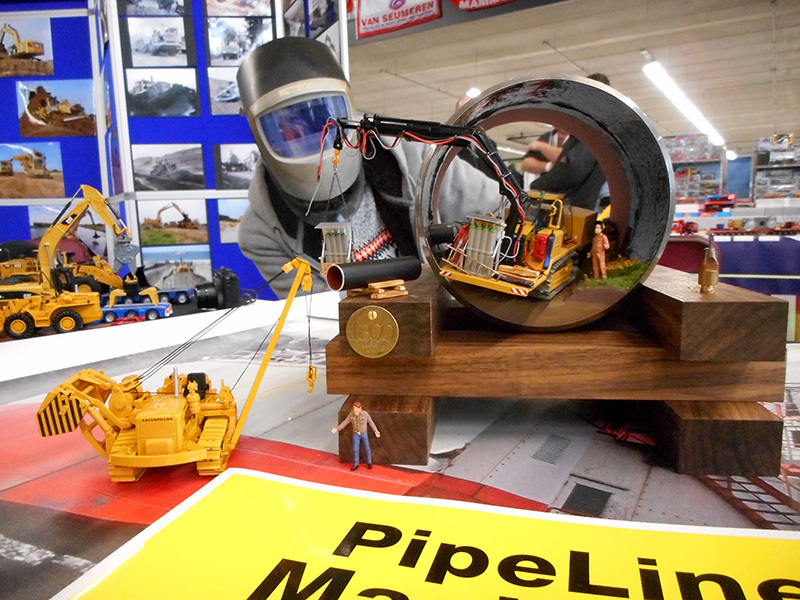 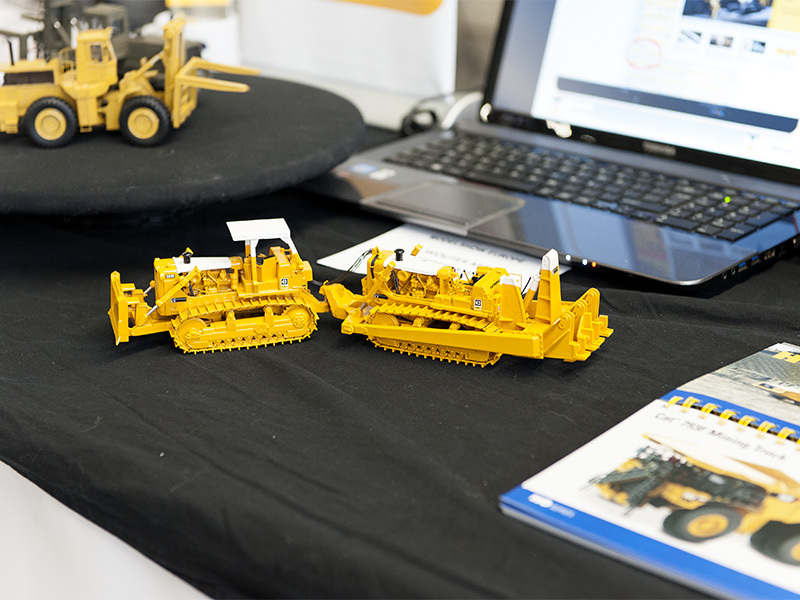 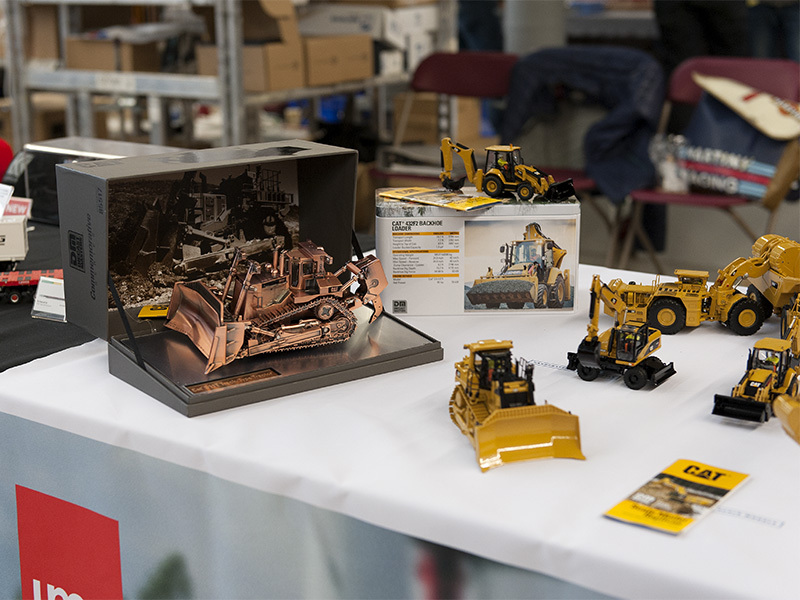 On this special exhibition one could once again see all kinds of miniatures and model construction projects in the field of earthmoving, cranes and heavy transport. 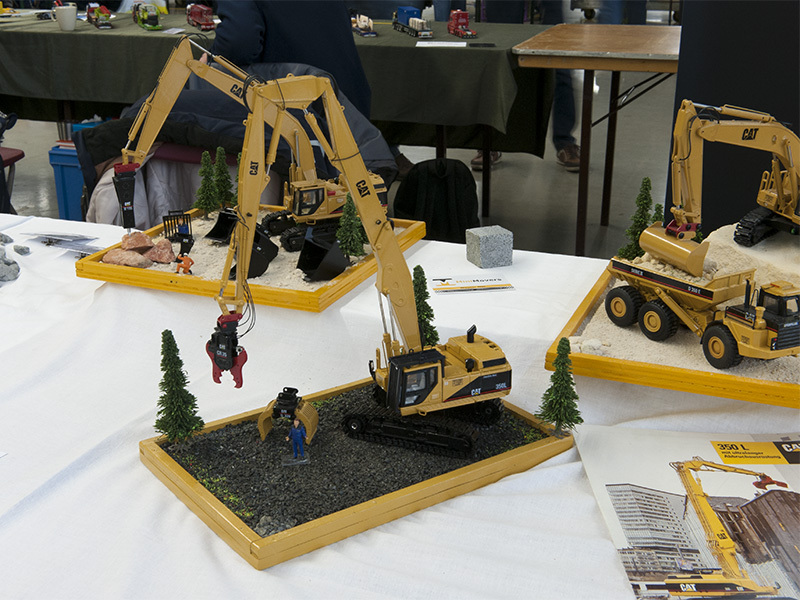 This Modelshow Europe exhibition is unique by its grand design and the only one in Europe. 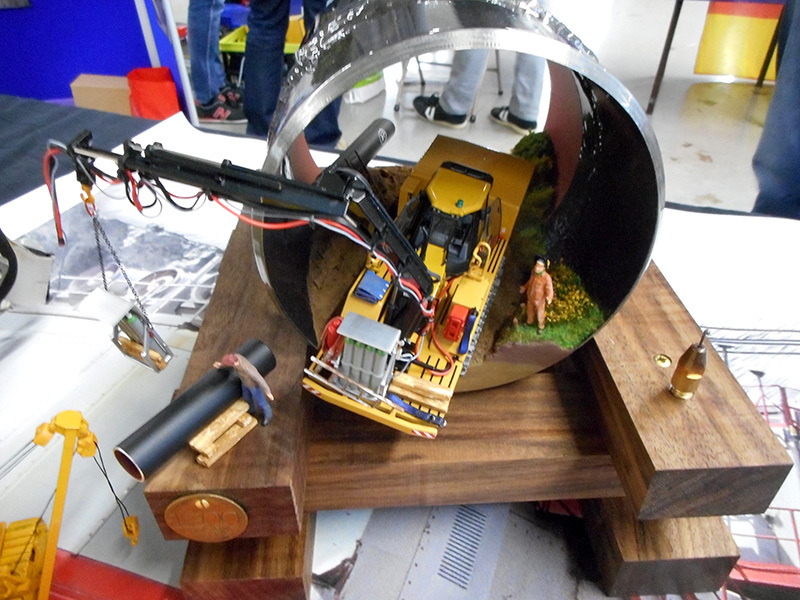 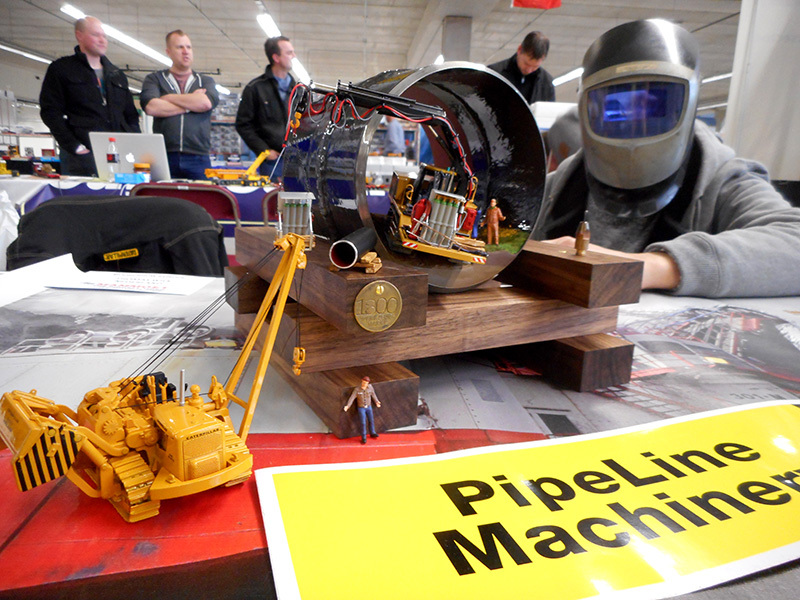 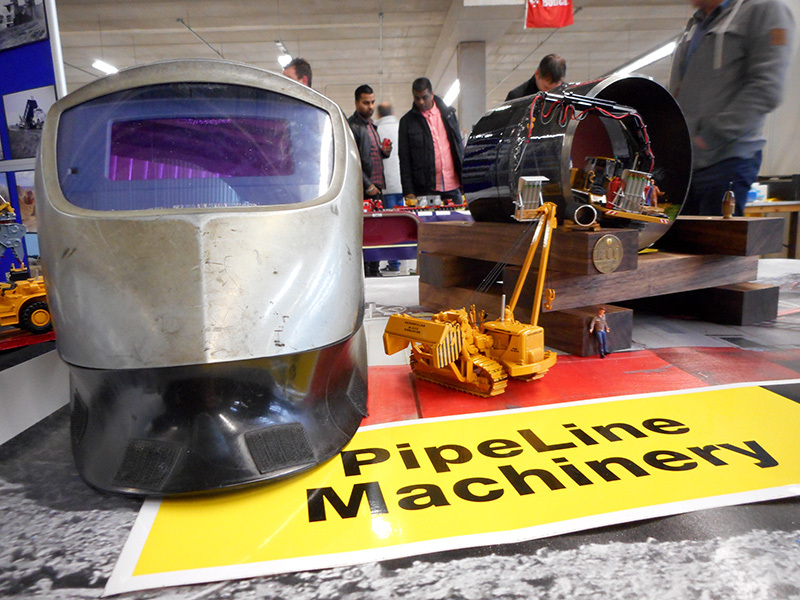 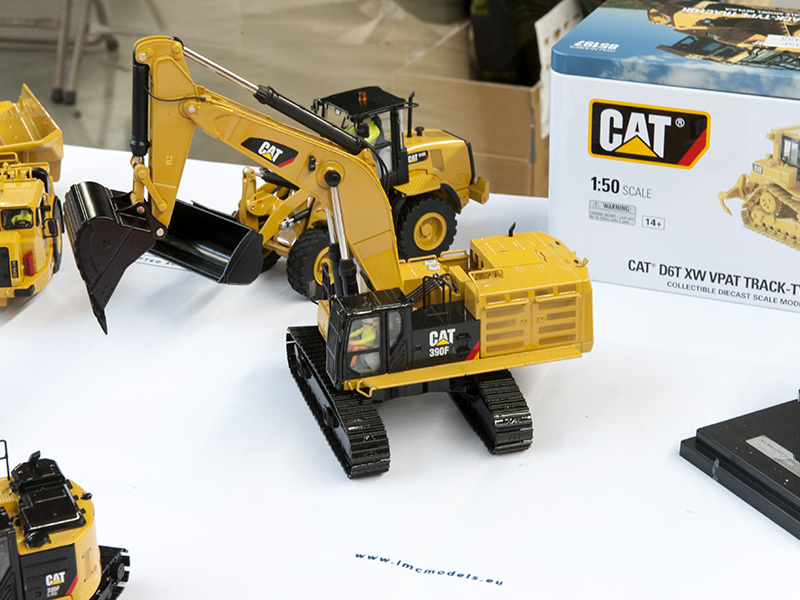 Many collectors and builders showed on the Modelshow Europe their (rebuilt and/or radio controlled) models. 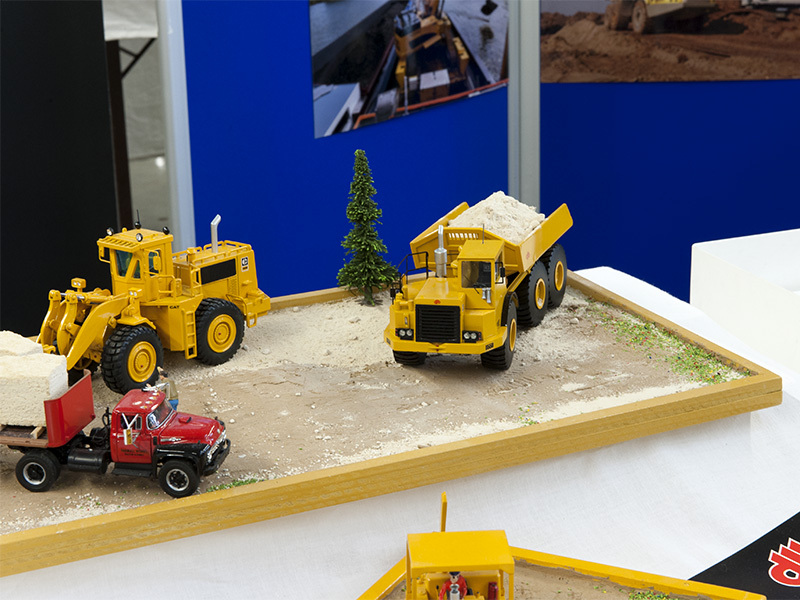 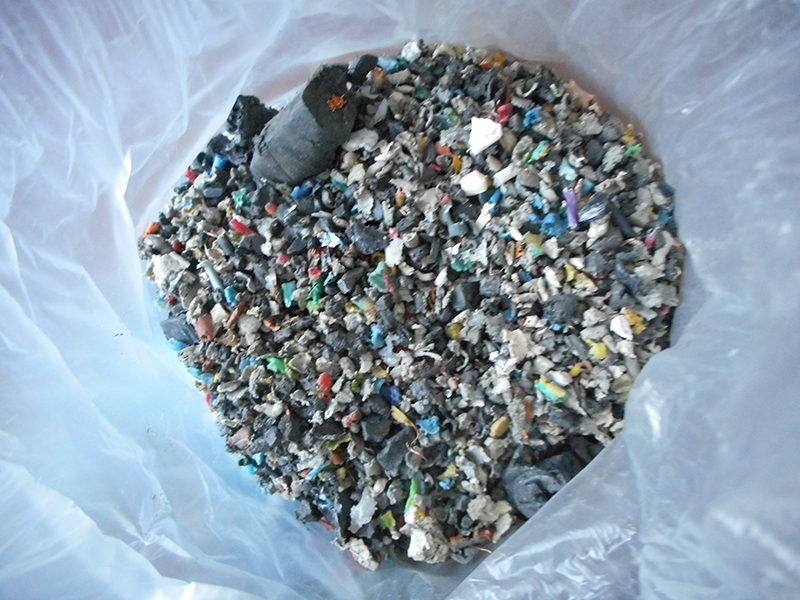 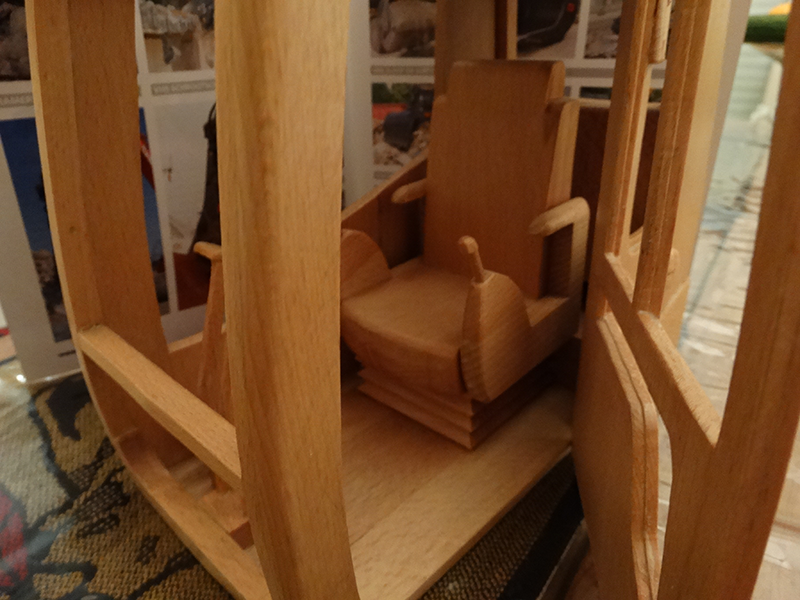 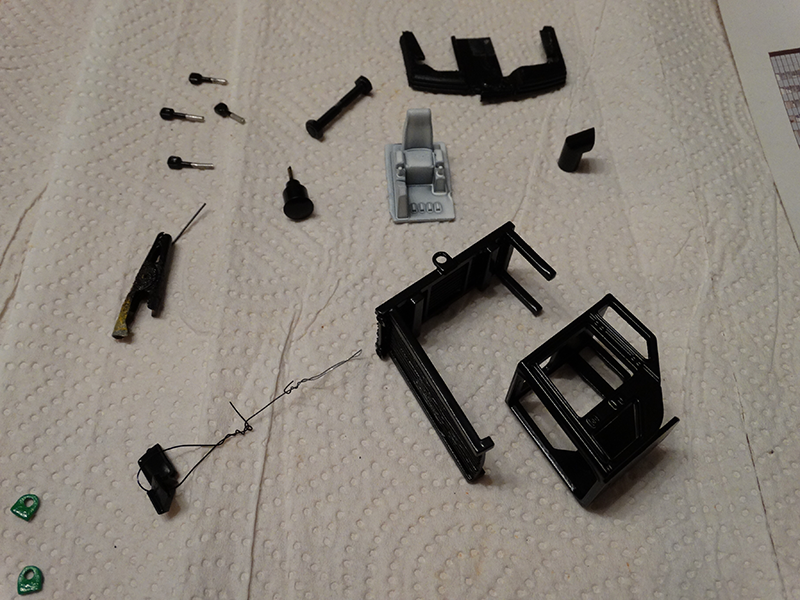 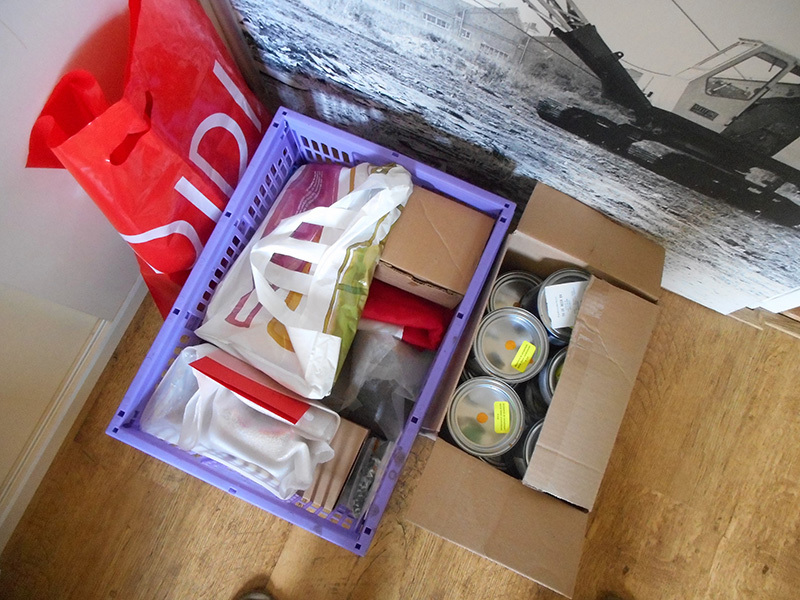 Also a wide range of miniatures and related components for the model where offered for sale. 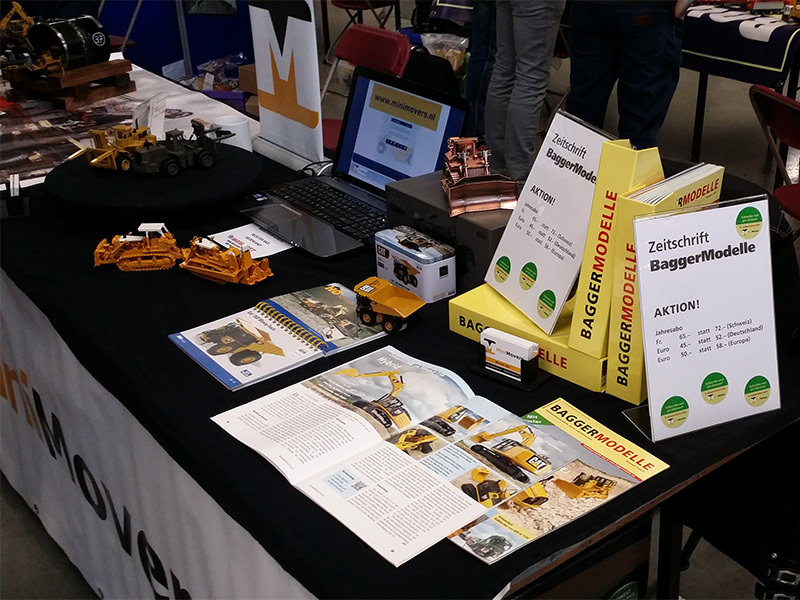 Ad Gevers staffed with Richard van der Horst, Anton Monshouwer, Huub van Dijke (Bouwmachinesvantoen and Bouwmachinesvannu), Gertjan Veld & Jack Schrijen again had a joint stand. 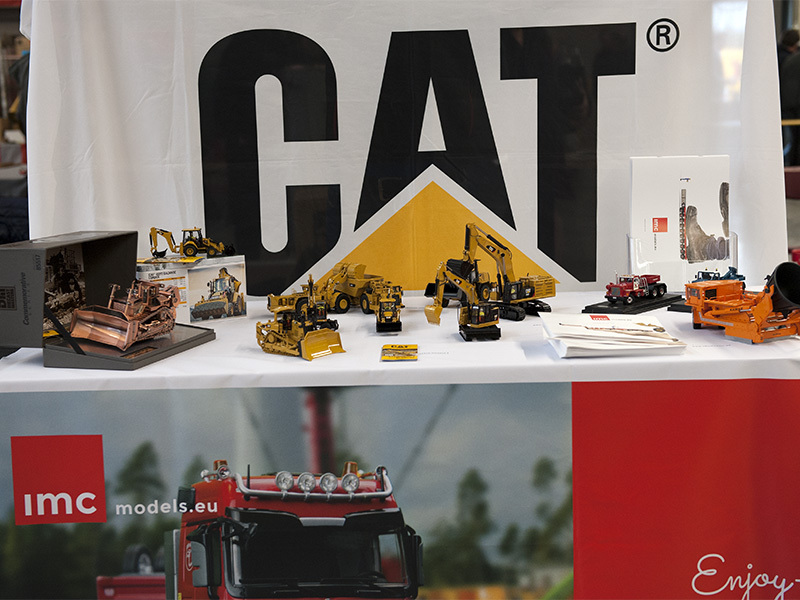 Mini Movers together with some members of our "CSVT" group from home and abroad, including photographer Thomas Wilk from TCC Photowork, was during the Modelshow Europe present in and around our booth. 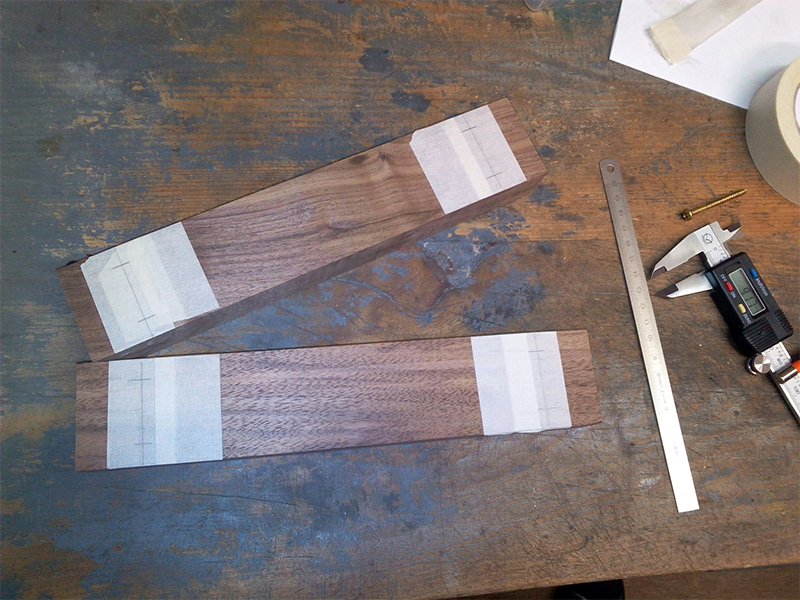 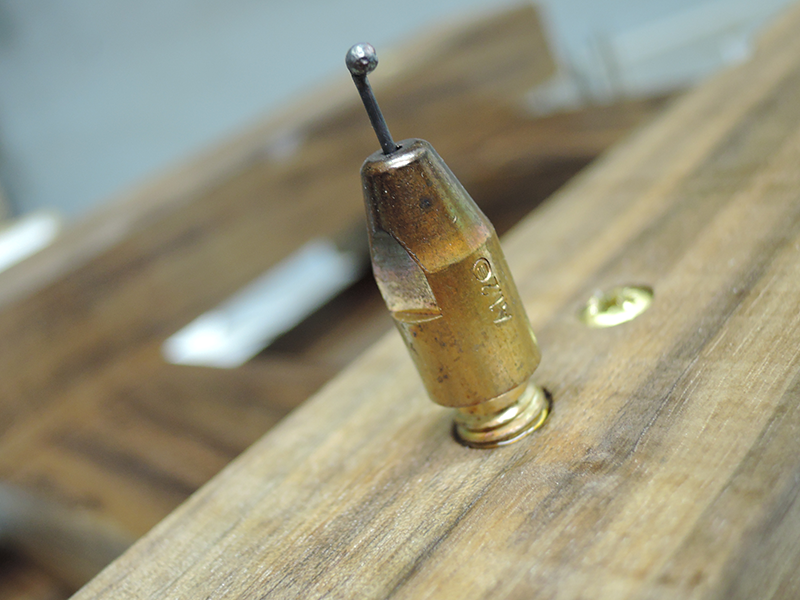 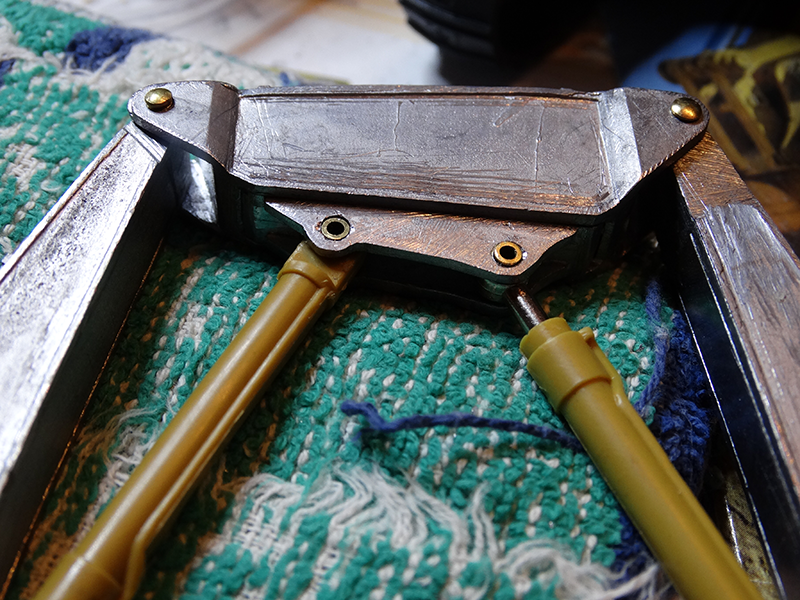 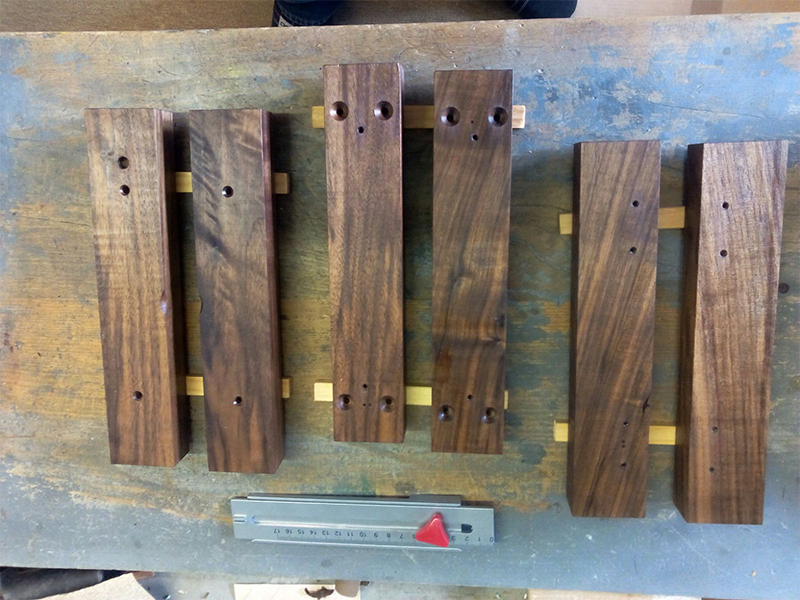 Curious about the outcome of our next custom projects? 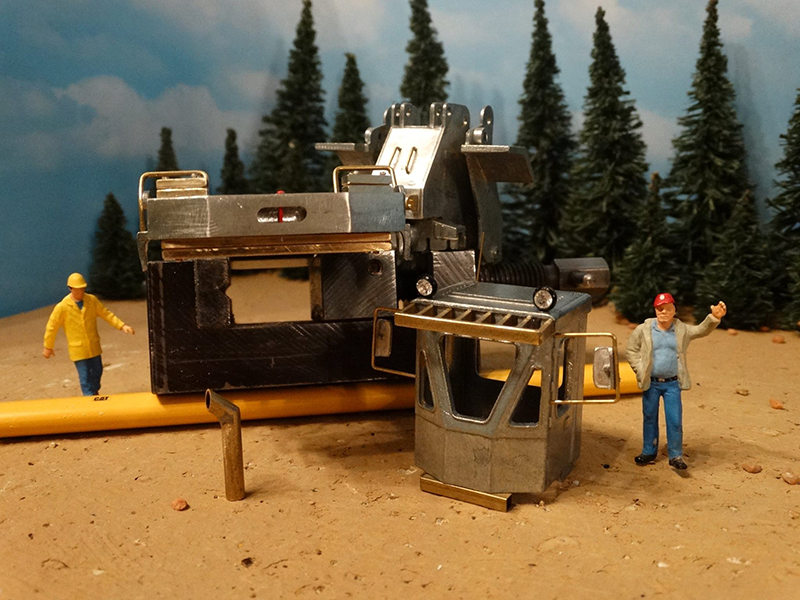 ...the good news is that Thomas will share the story behind this custom Caterpillar D6K Welding Track-Type Tractor and the realization of this unique project in a "Making of..." which will start soon. 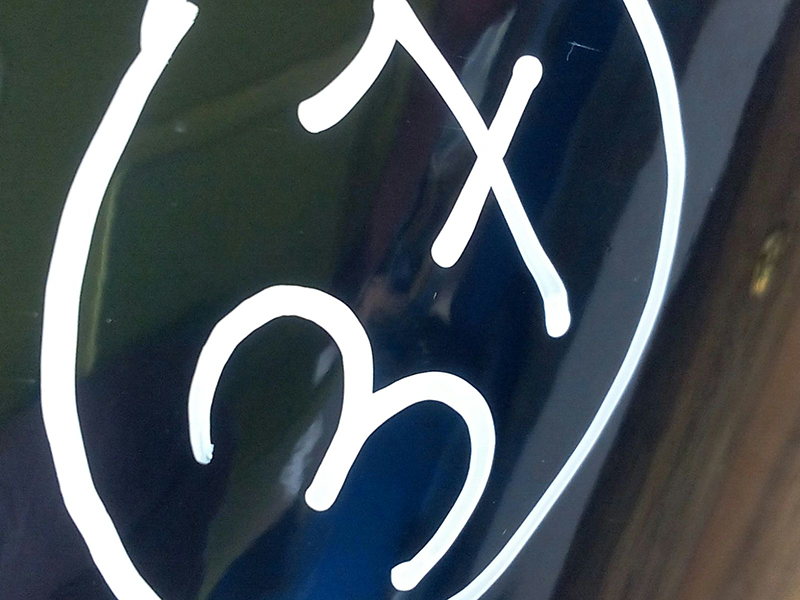 So stay tuned in for more! 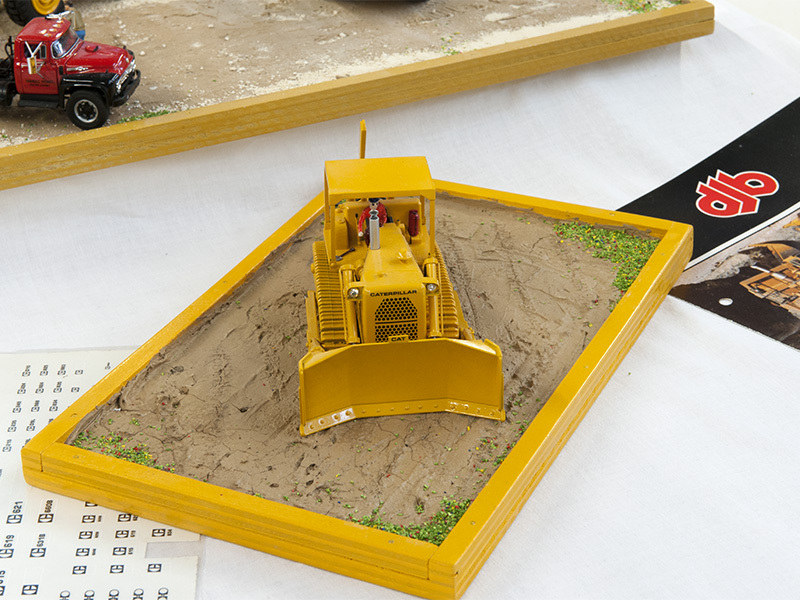 First he brought along his Caterpillar D9R DOOBI Track-Type Tractor which he built based on the kit in scale 1:48 of CypModels. 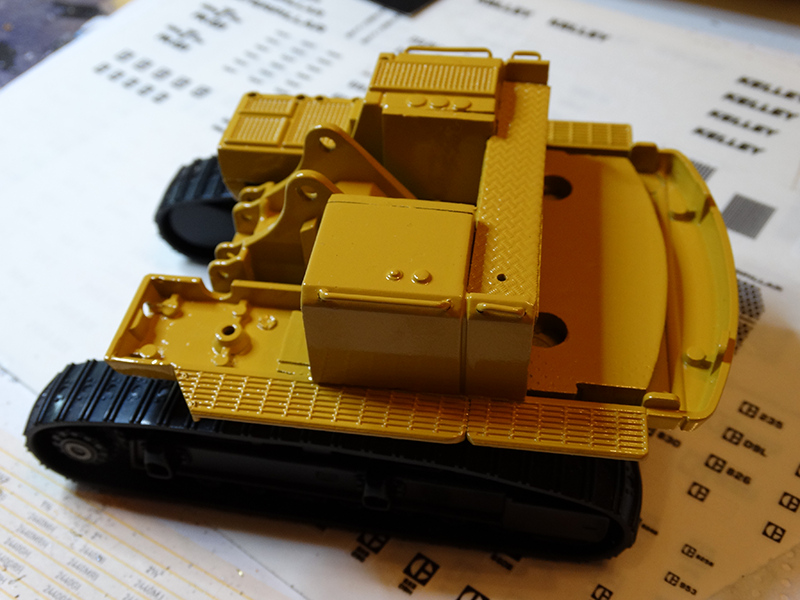 Secondly he showed us his Caterpillar D8T WH Track-Type Tractor with WDA CARON DSU dozer blade & CARON SWS Tracks in 1:50 on the basis of the Norscot D8T and three exclusive kits: The resin CARON DSU Trash Blade comes from a very exclusive kit which is based on the metal Trash Blade made by Jay Roltgen and the CARON SWS metal Tracks and the Back box where both exclusive cADSttachments kits. 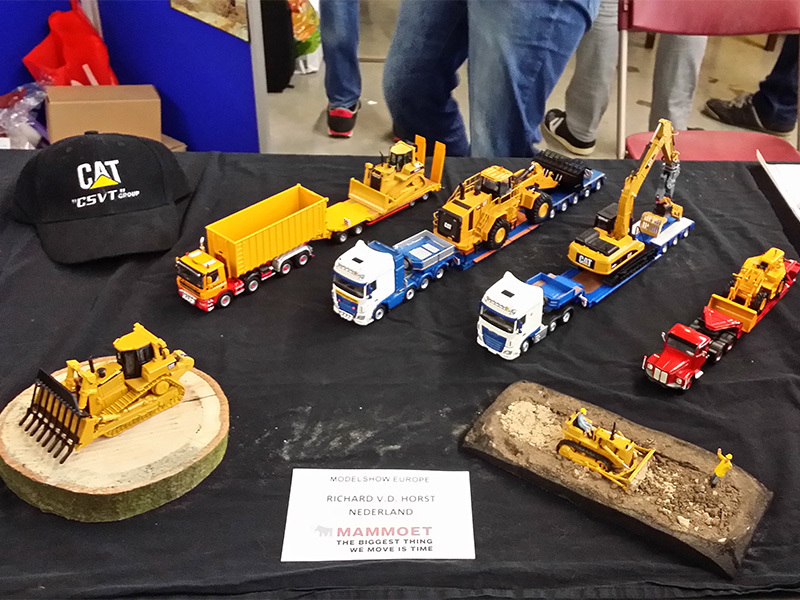 (Sorry for those who are interested but I have to disappoint you that all three of these kits where and are not available for sale). 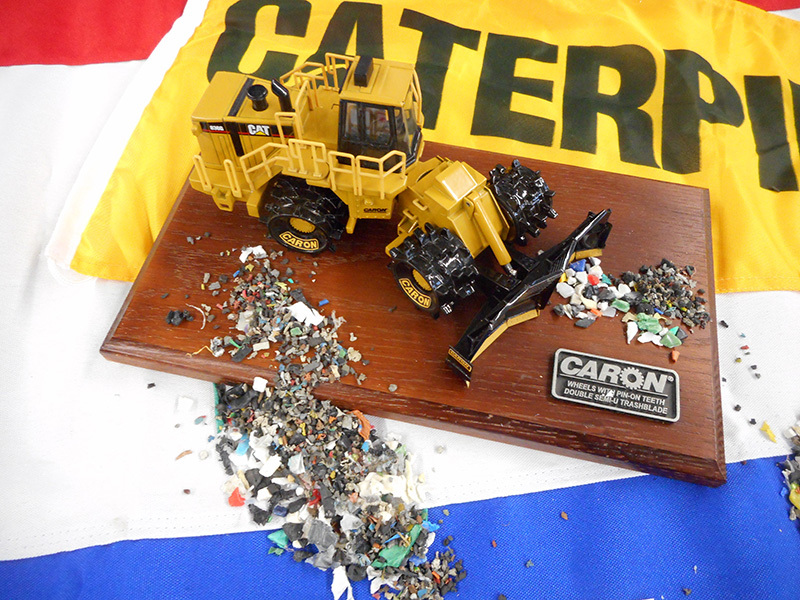 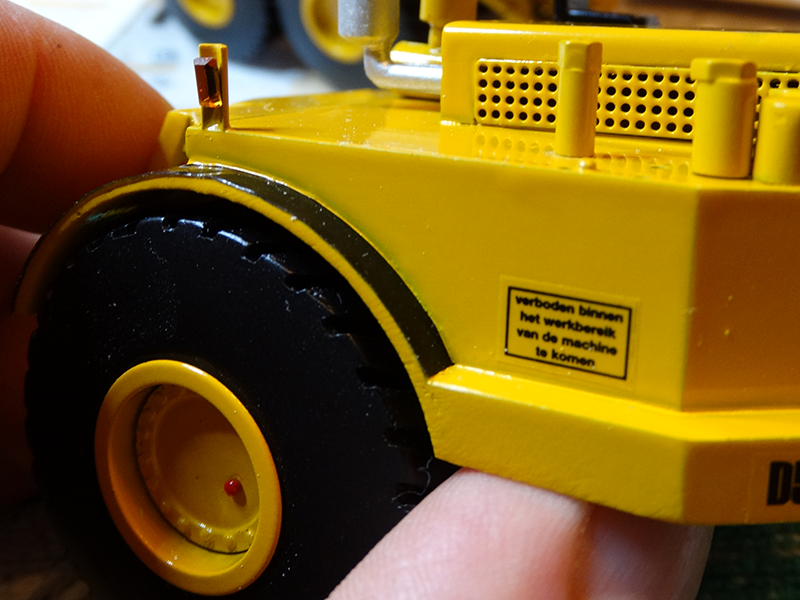 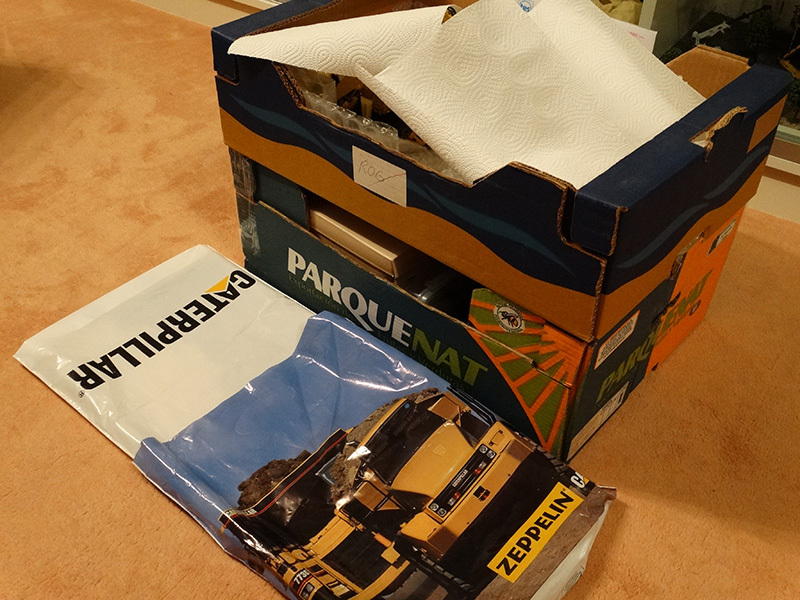 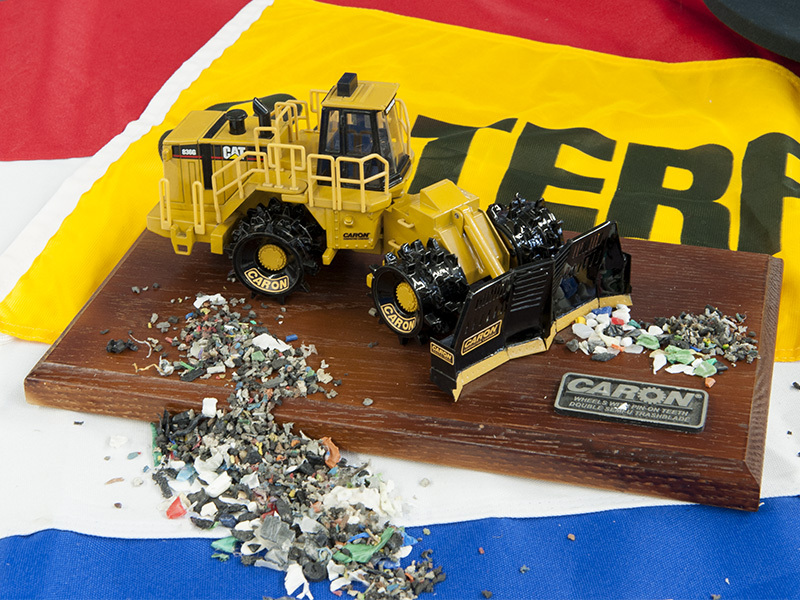 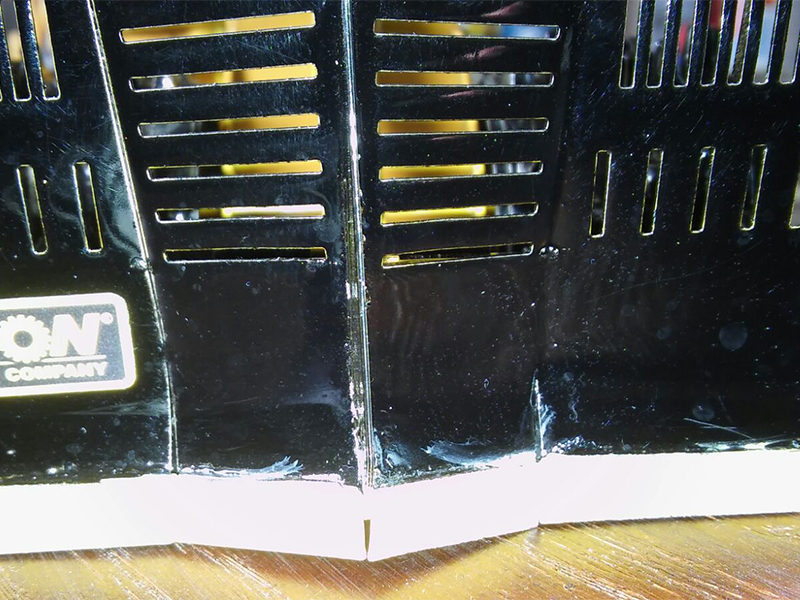 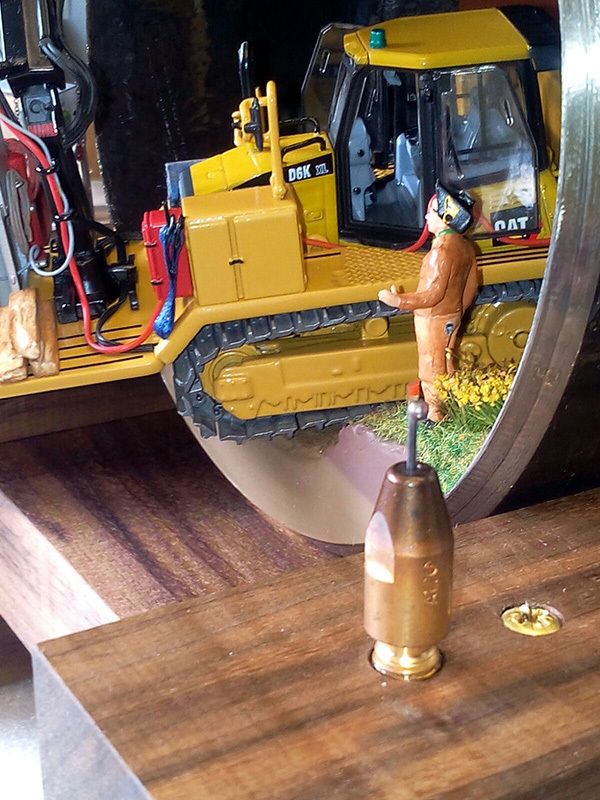 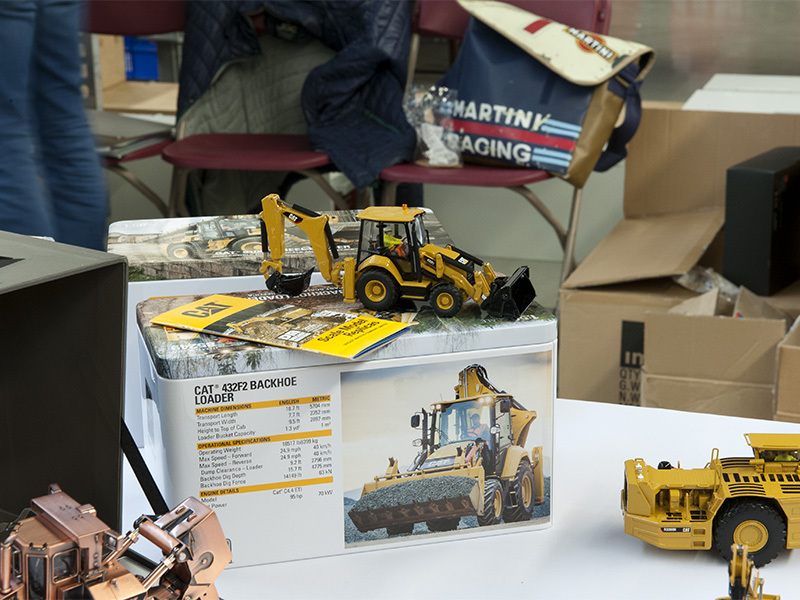 Finally, and as the biggest surprise, he brought along the scale model of the Caterpillar 836G CARON Compactor exclusively in this design which as a promotional gift has been built in a very limited number for the Caron Compactor Company from America and never was available for sale. 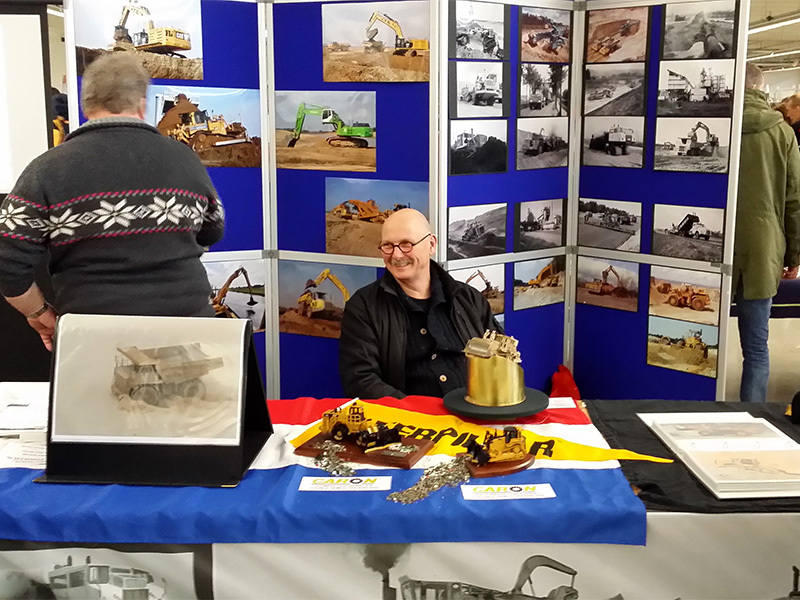 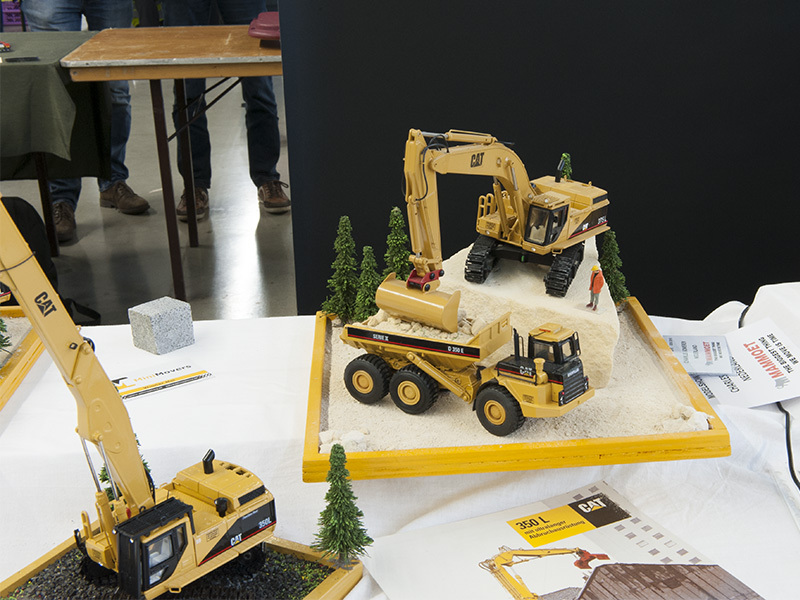 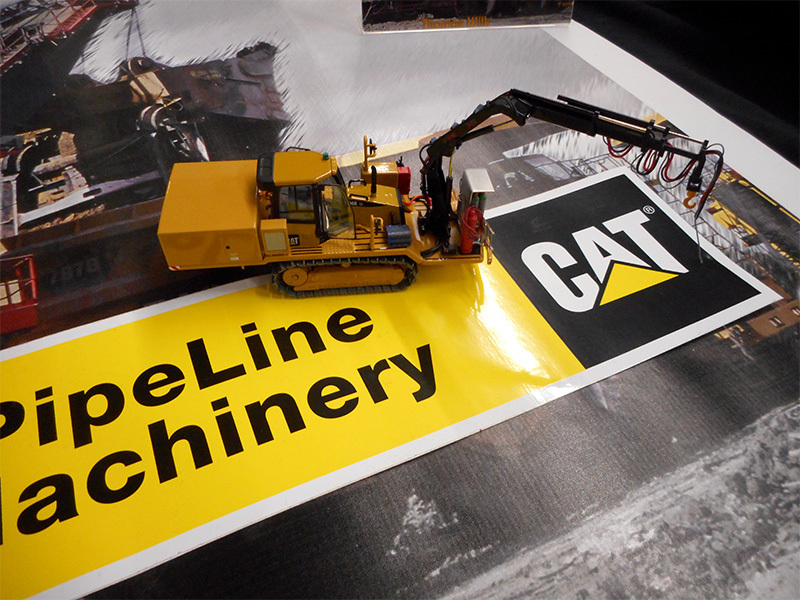 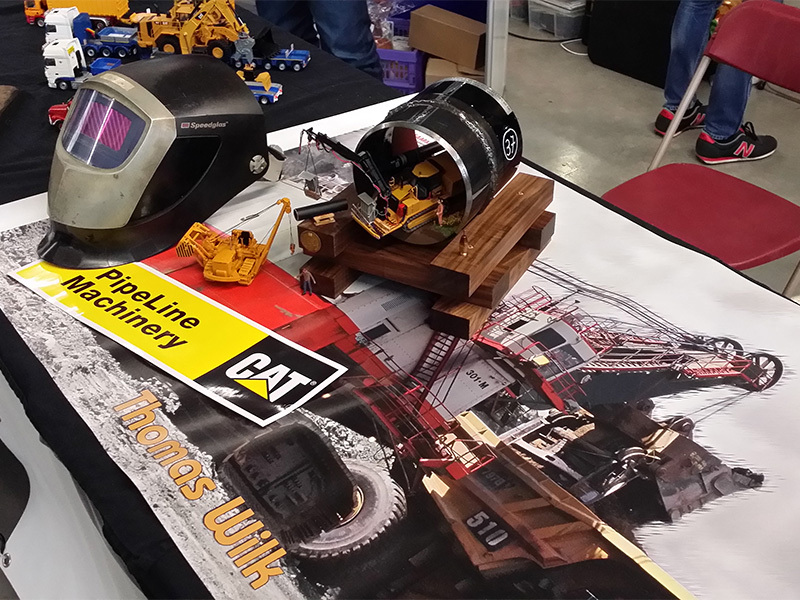 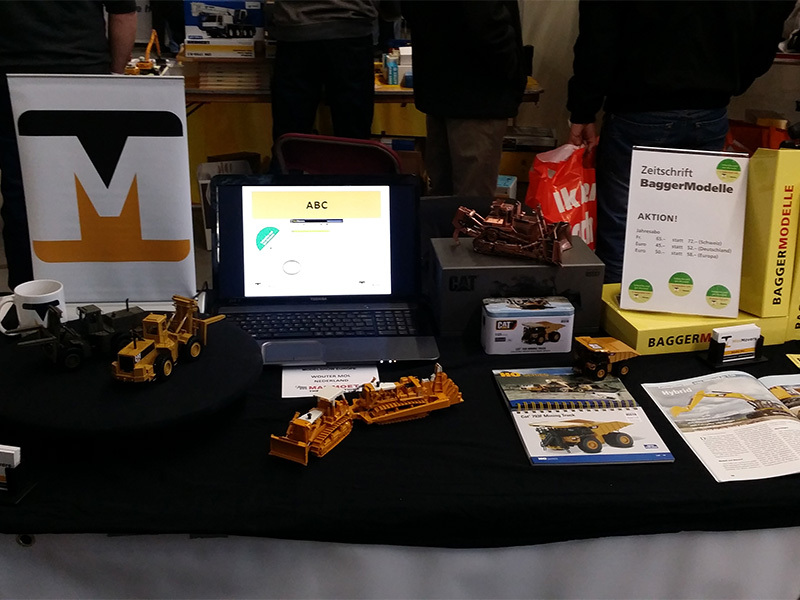 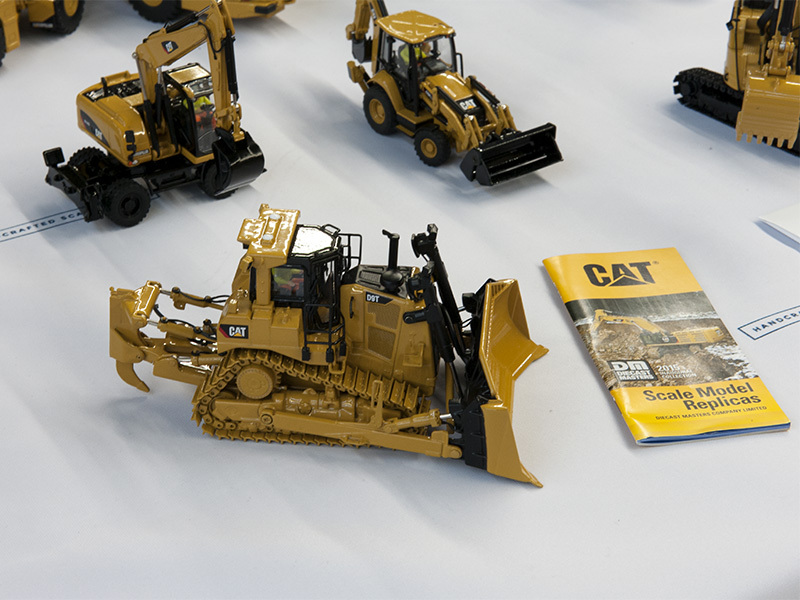 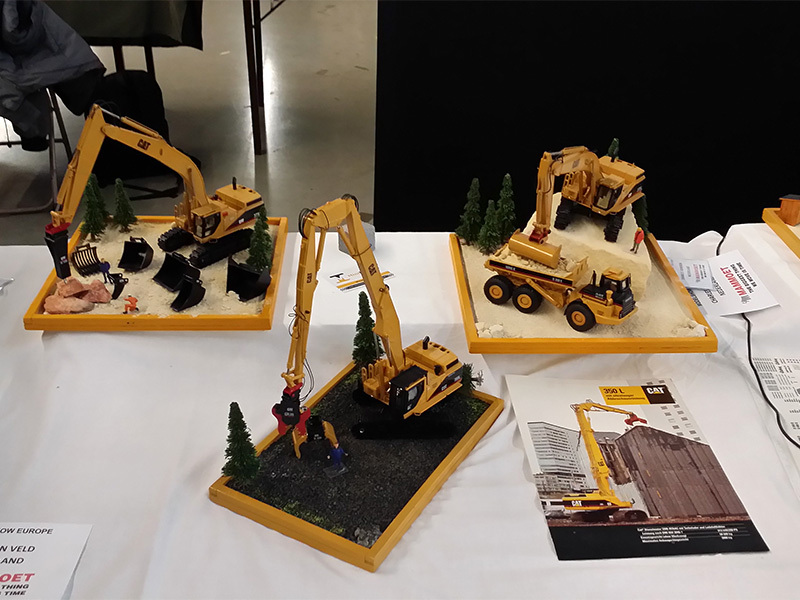 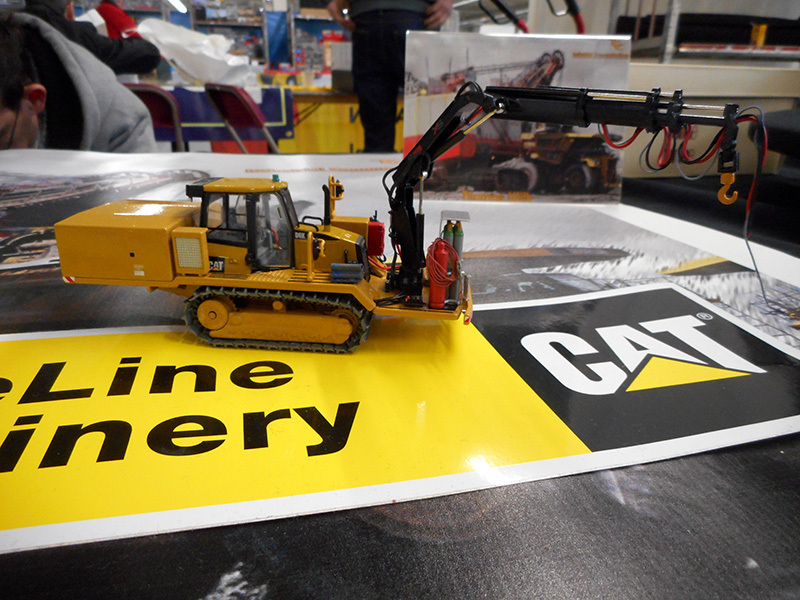 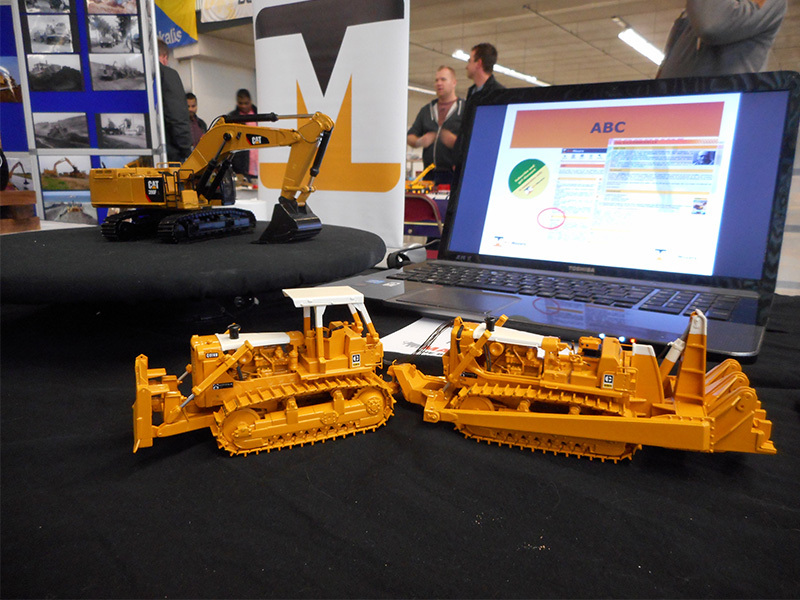 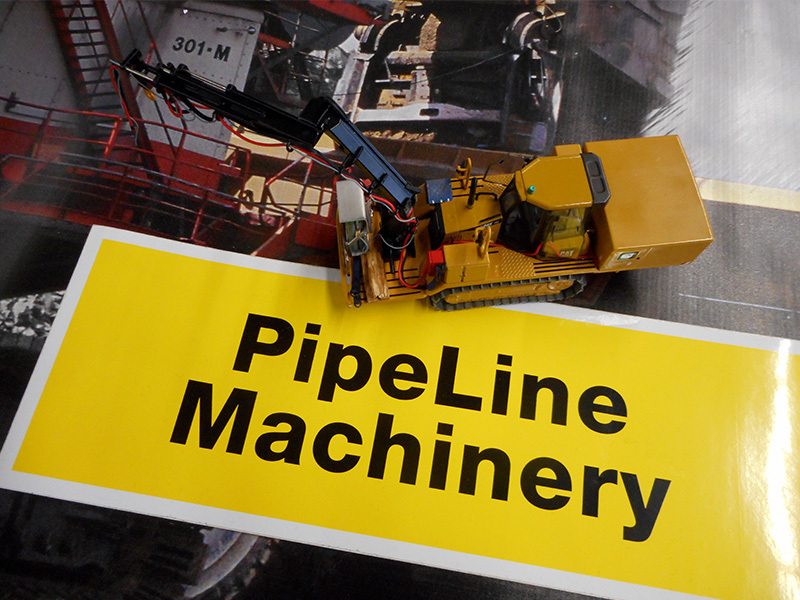 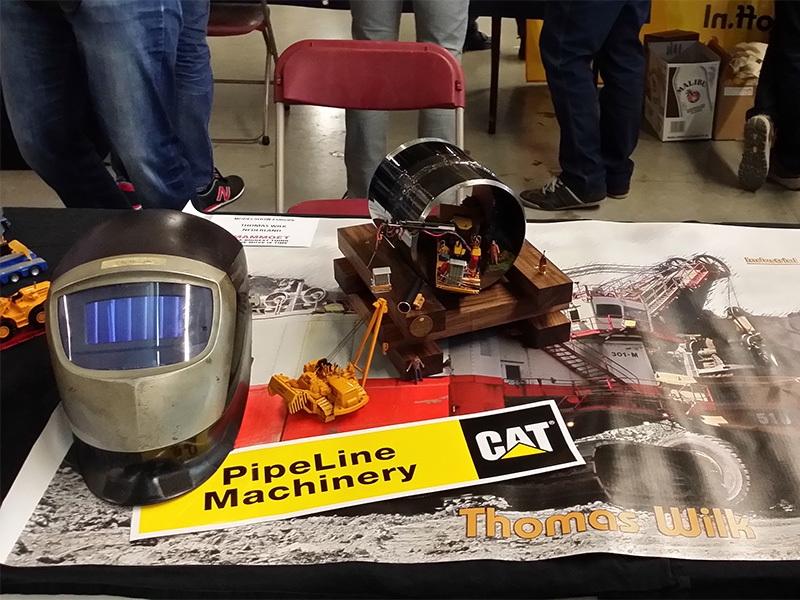 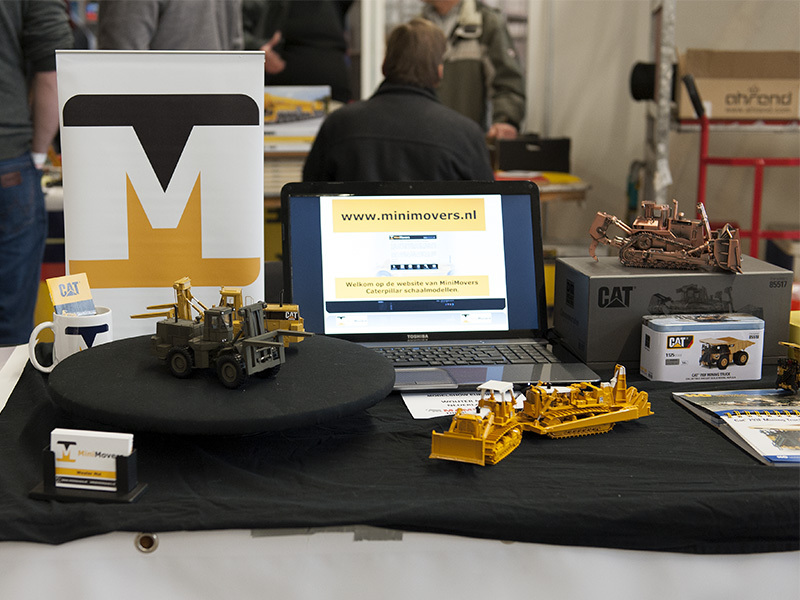 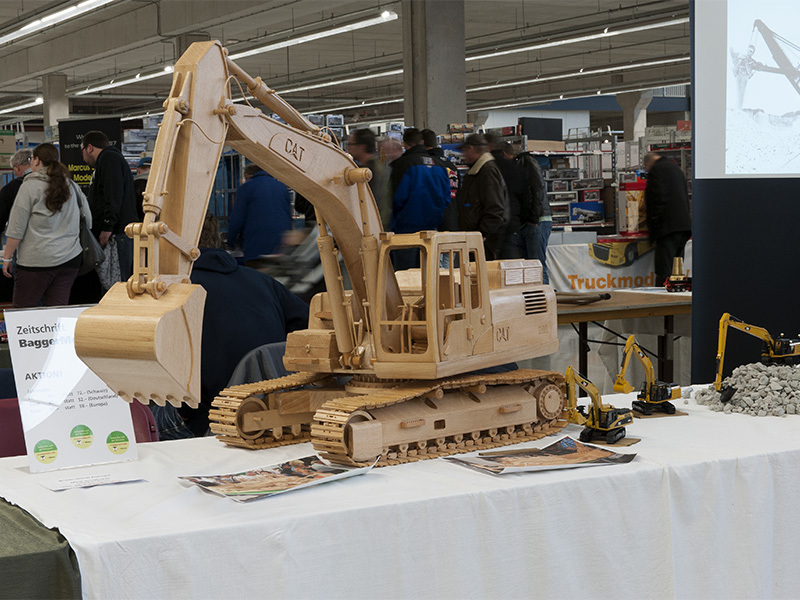 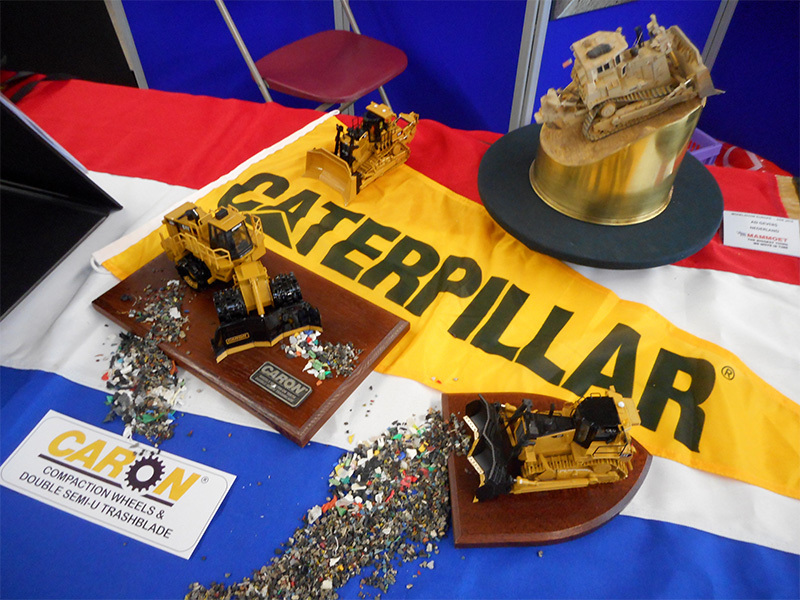 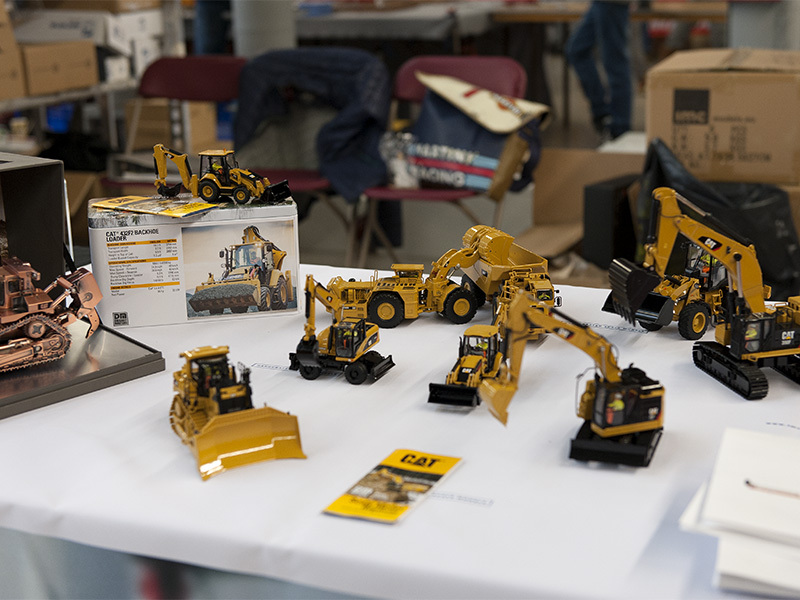 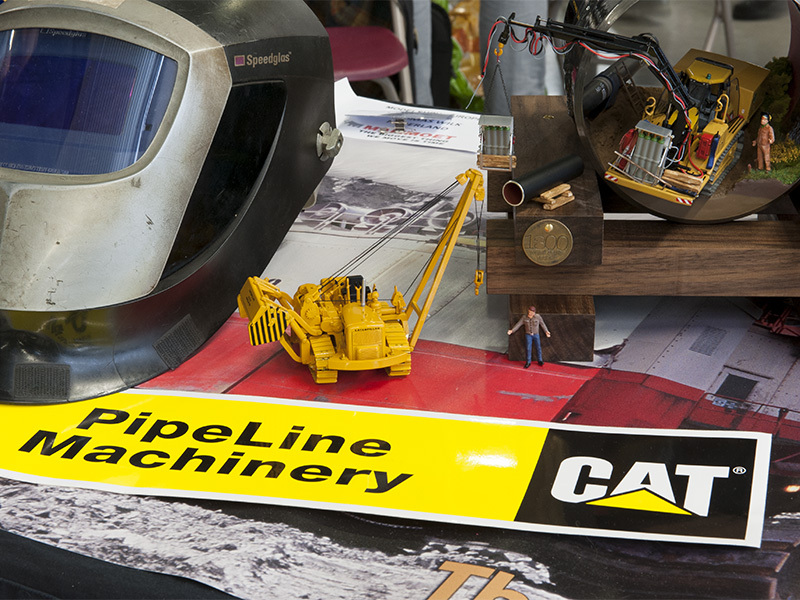 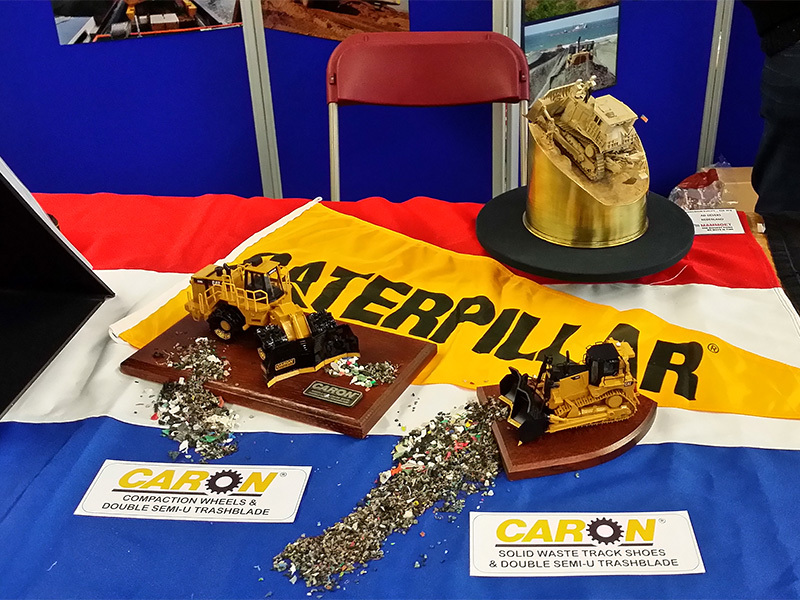 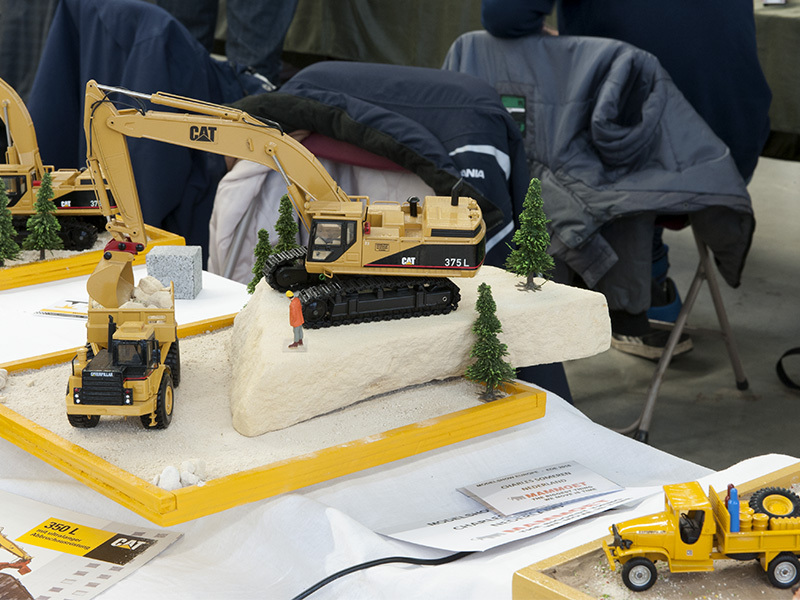 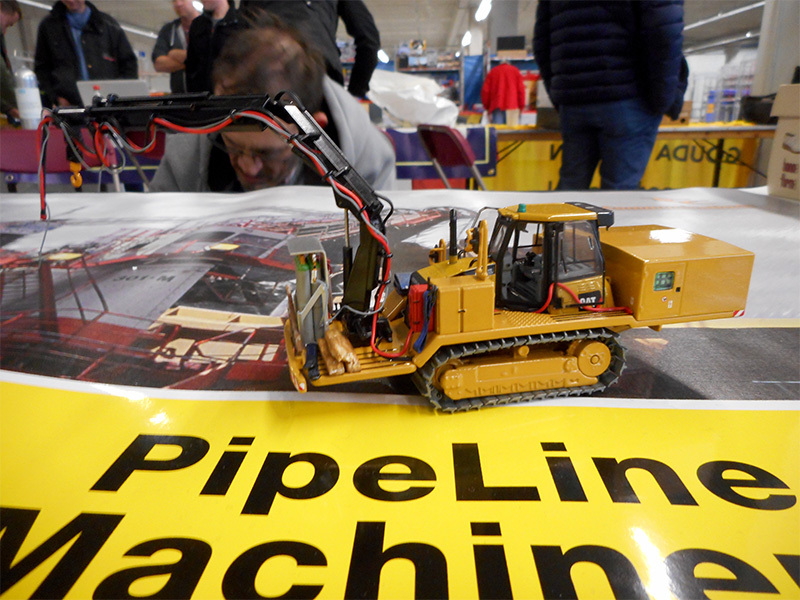 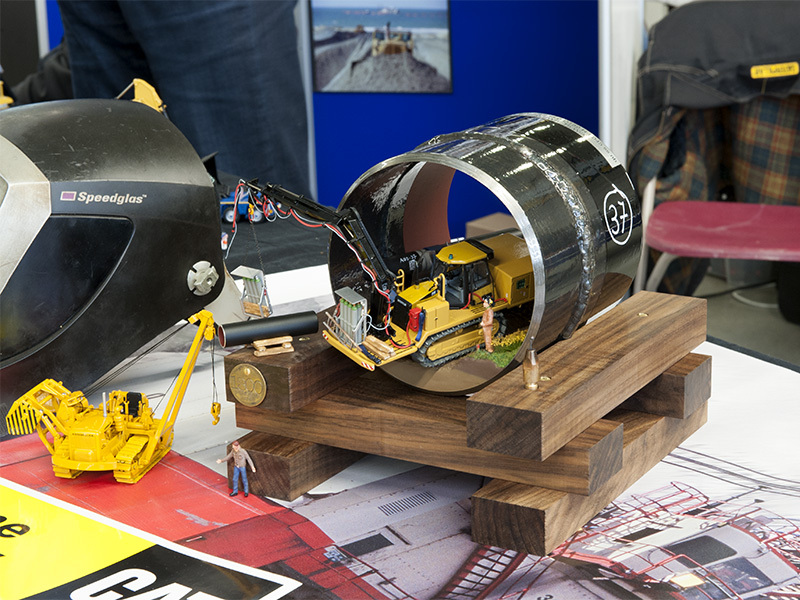 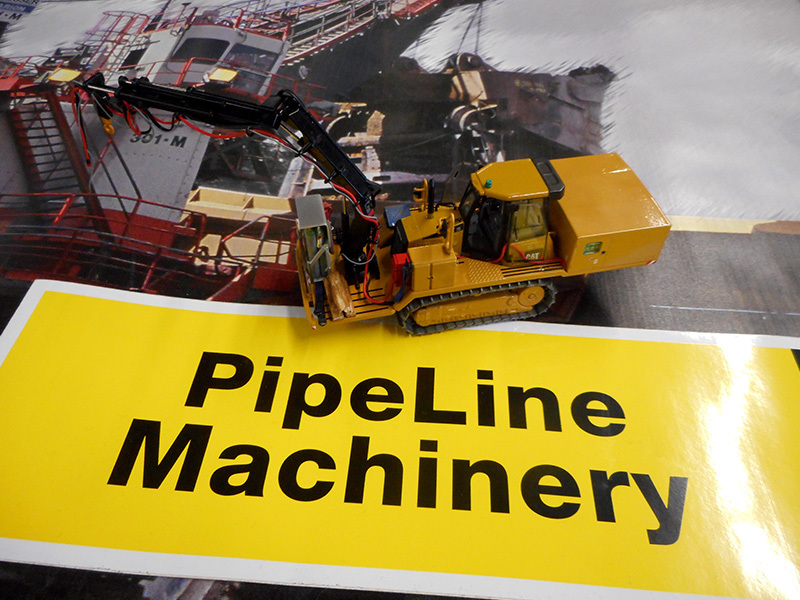 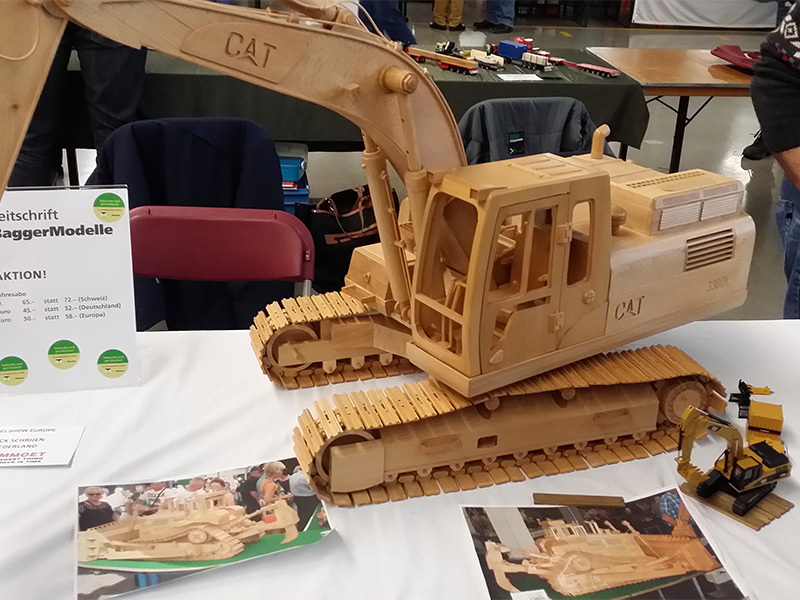 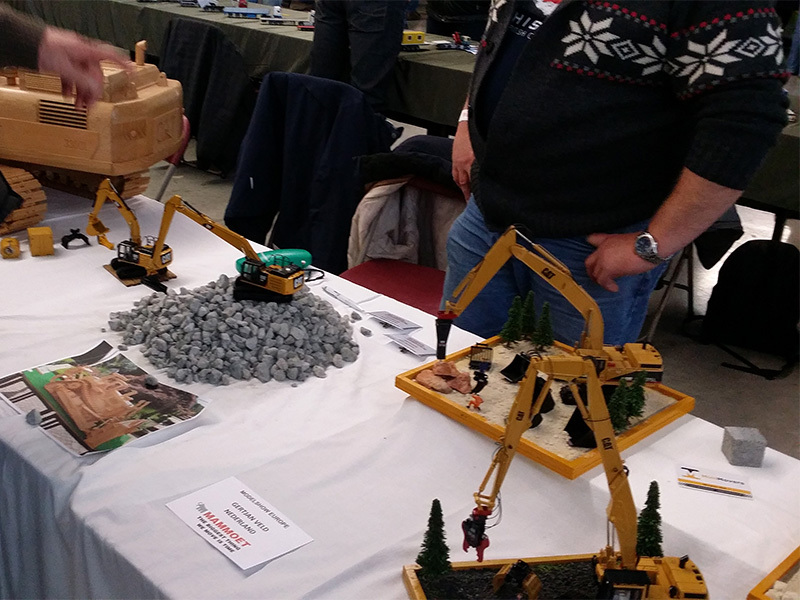 Gertjan brought this year a number of unique custom-built Caterpillar models along to the Modelshow Europe in 2016. 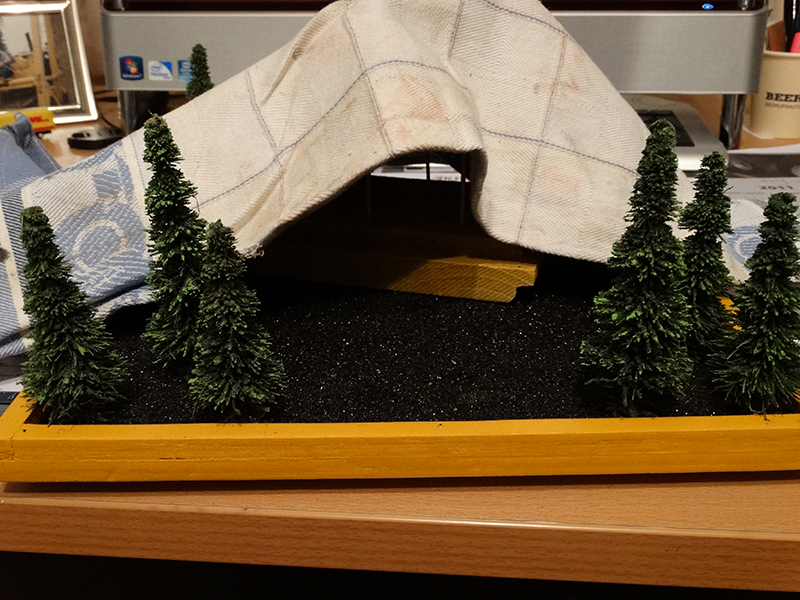 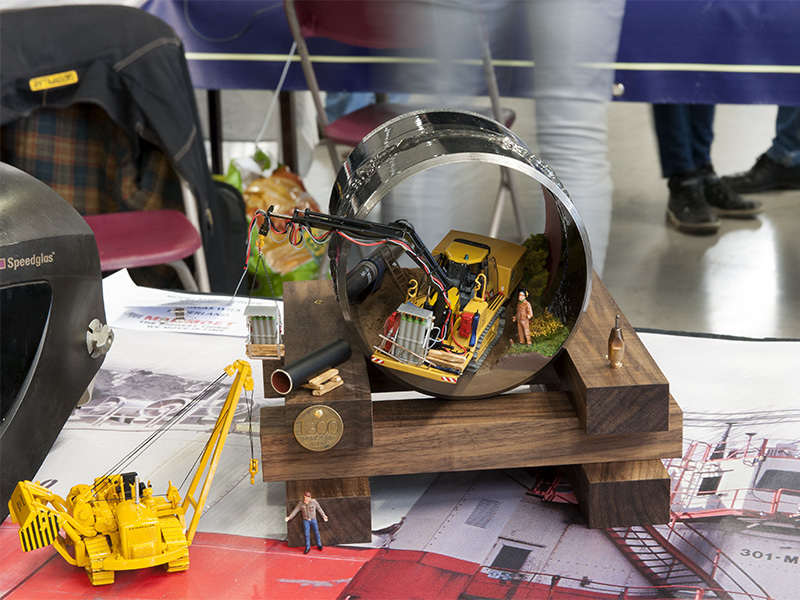 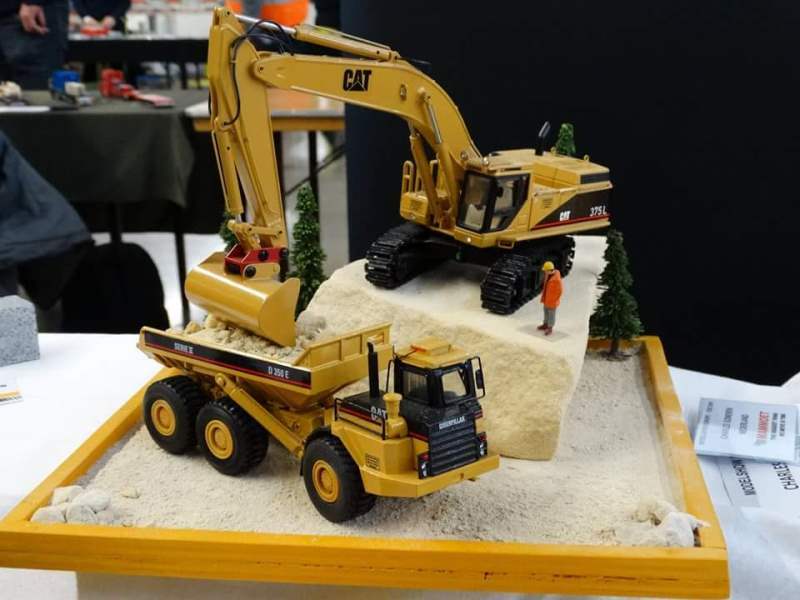 Special is that Gertjan also every year sees an opportunity to make its models even more come into their own on the mini dioramas which he presents his models. 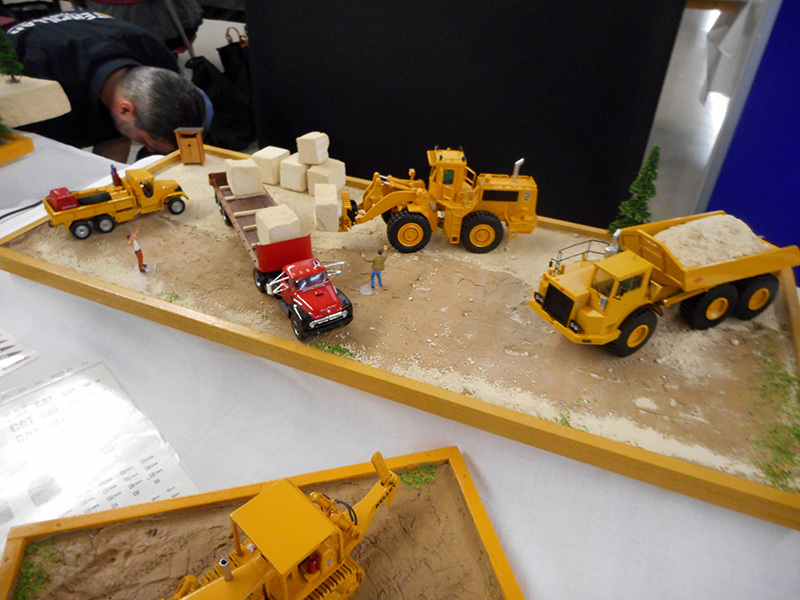 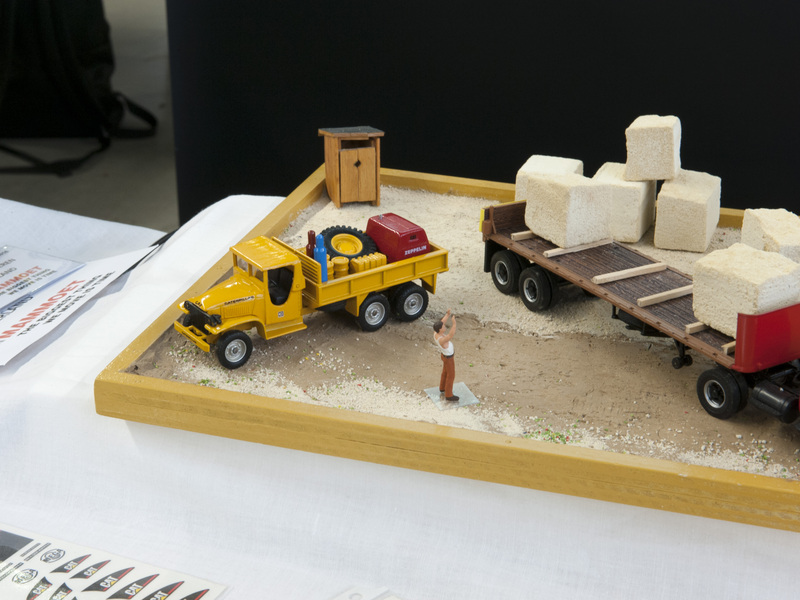 Some of his custom models are also be admired in the "Making of..." series and in addition Gertjan also made some brief explanatory notes giving a little idea of how he established the displayed hand-built models. 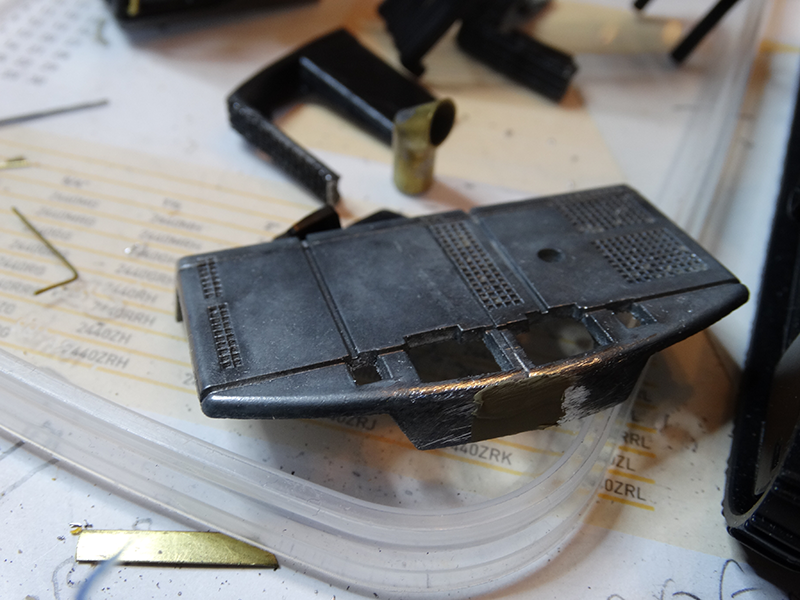 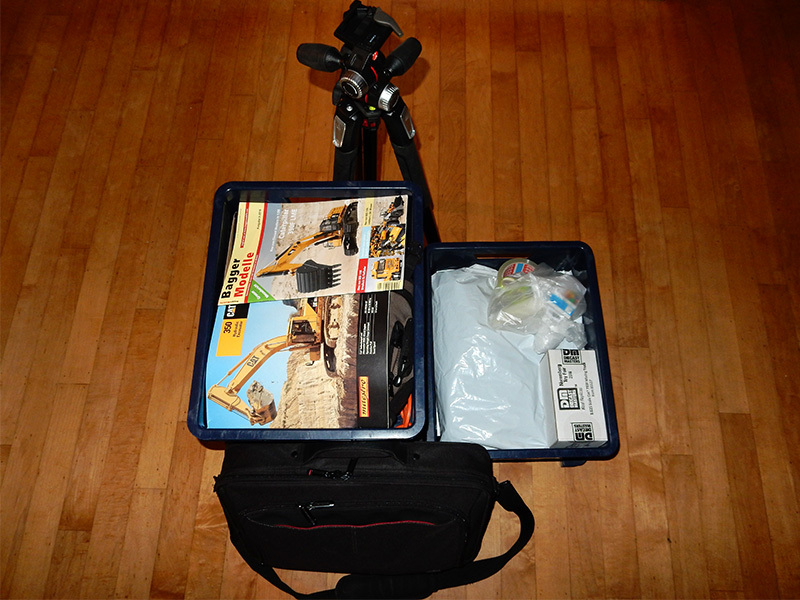 More photos, and even more photos later this week! 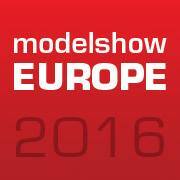 This year was the first time that IMC Models was present with a booth at the Modelshow Europa 2016. 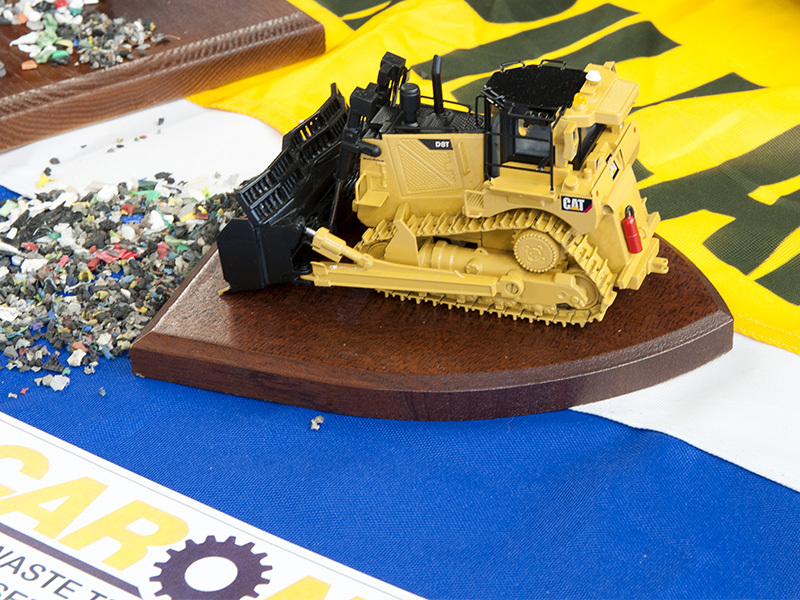 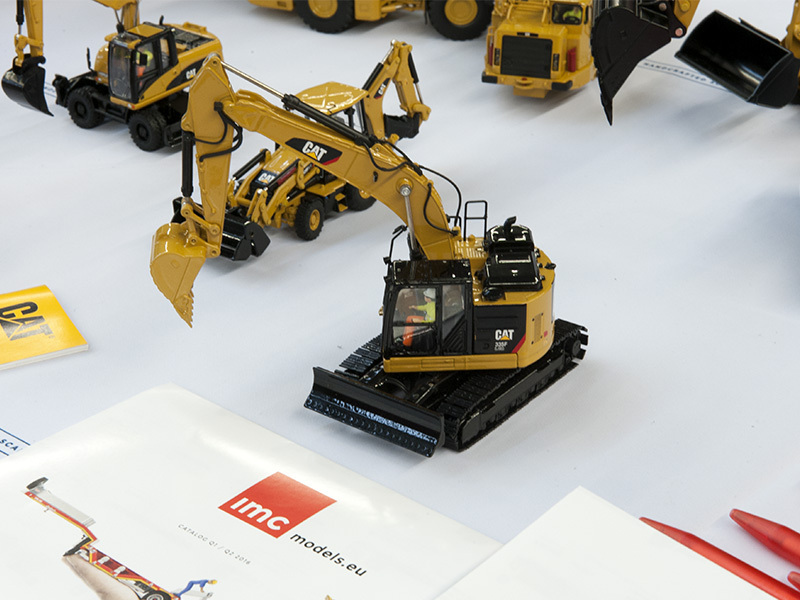 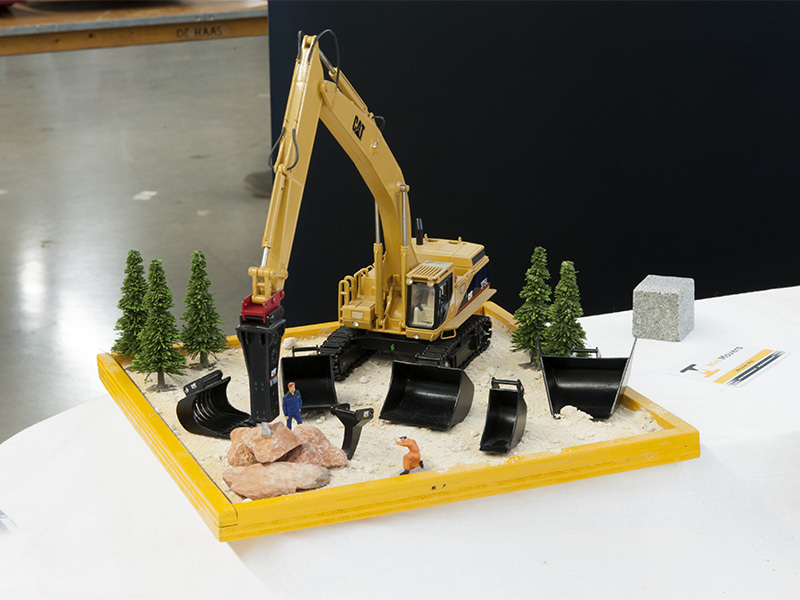 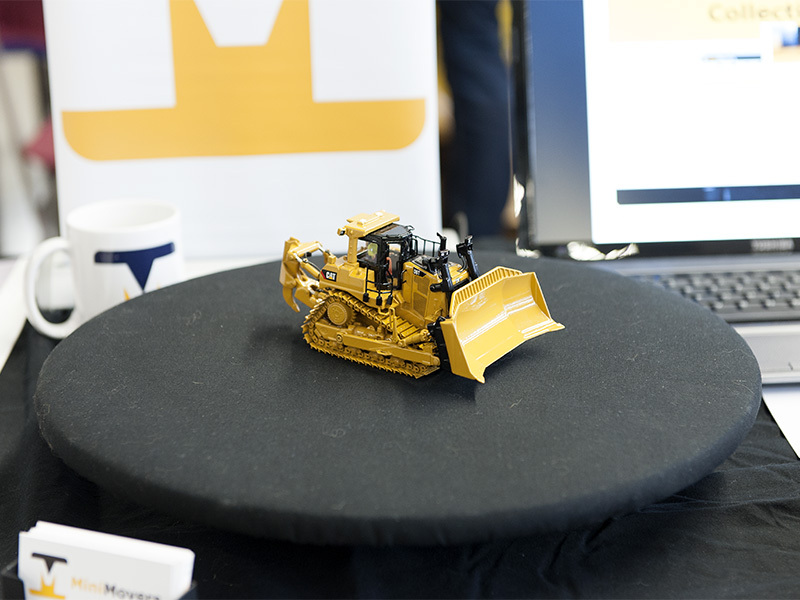 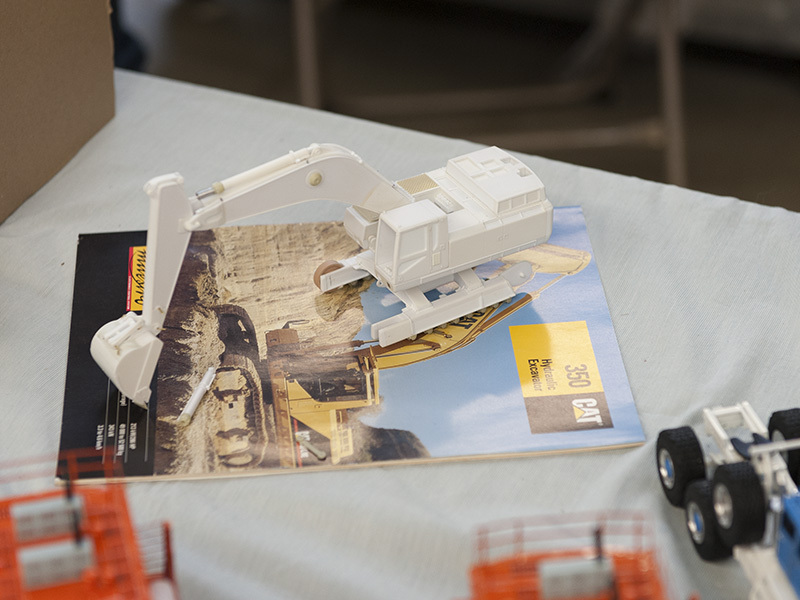 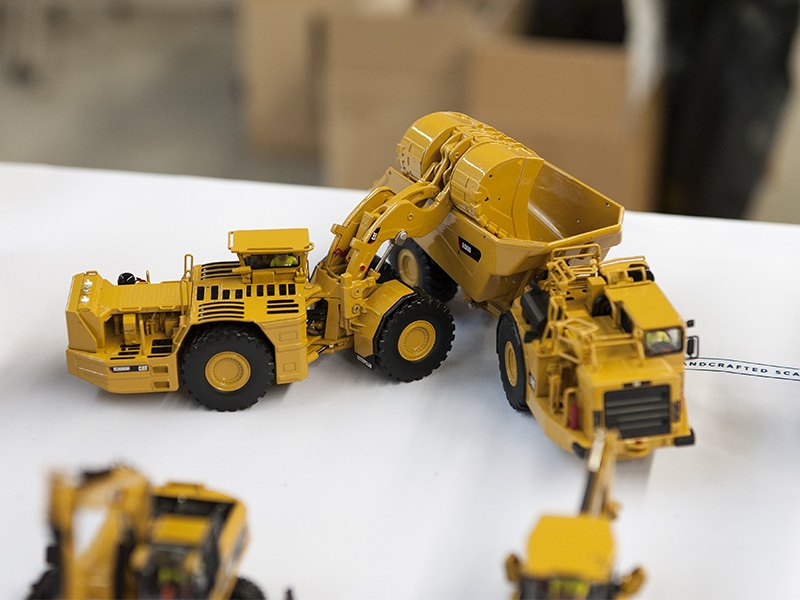 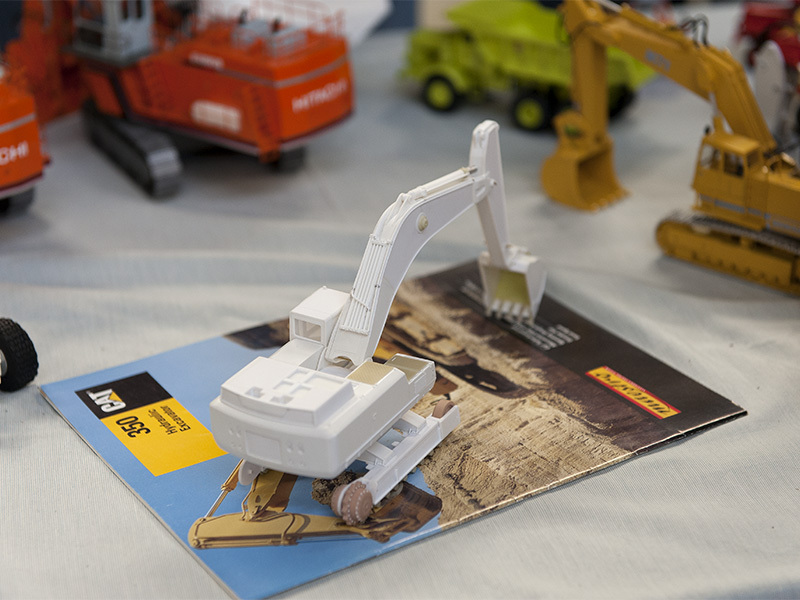 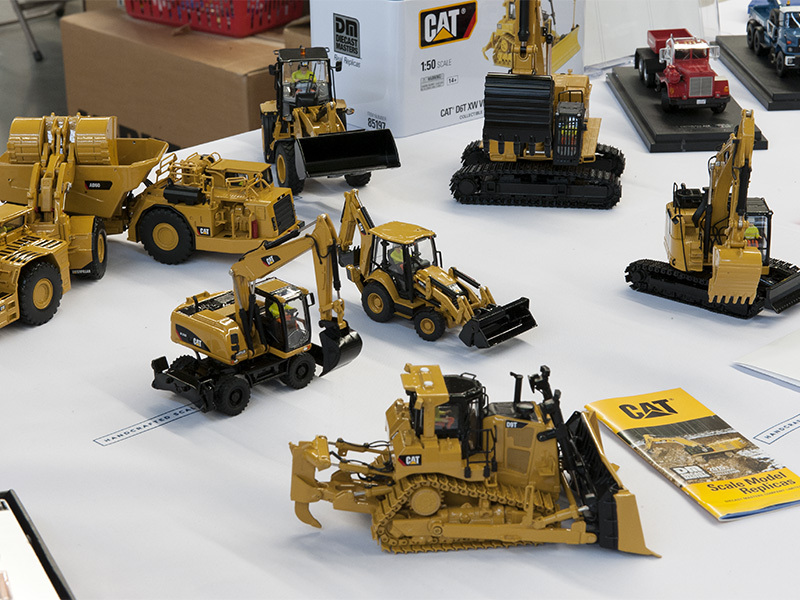 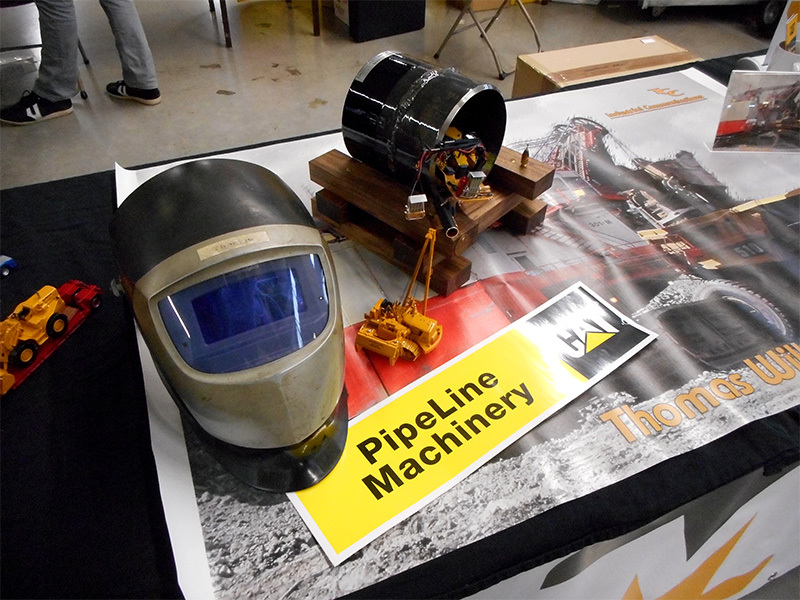 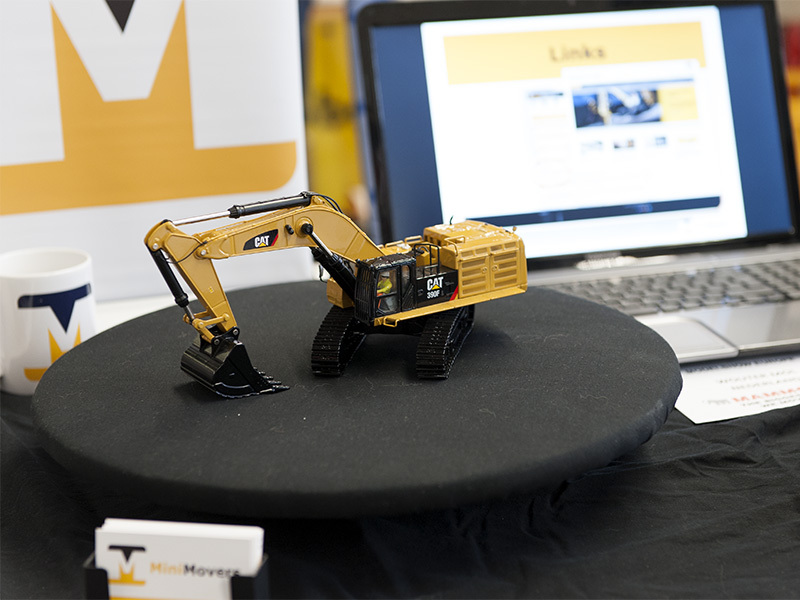 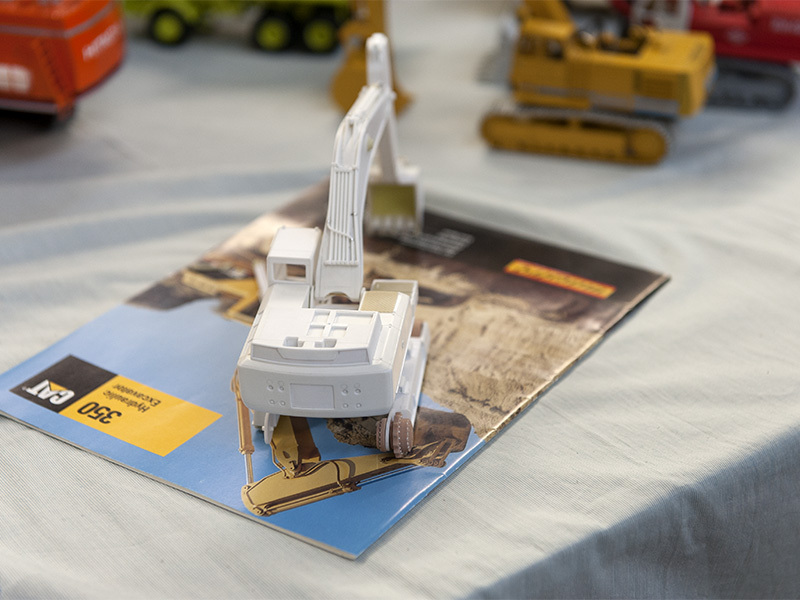 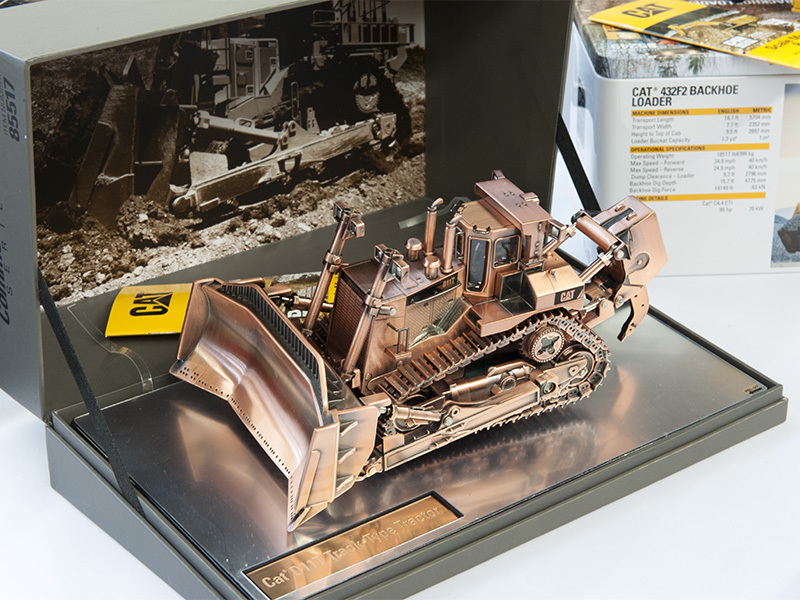 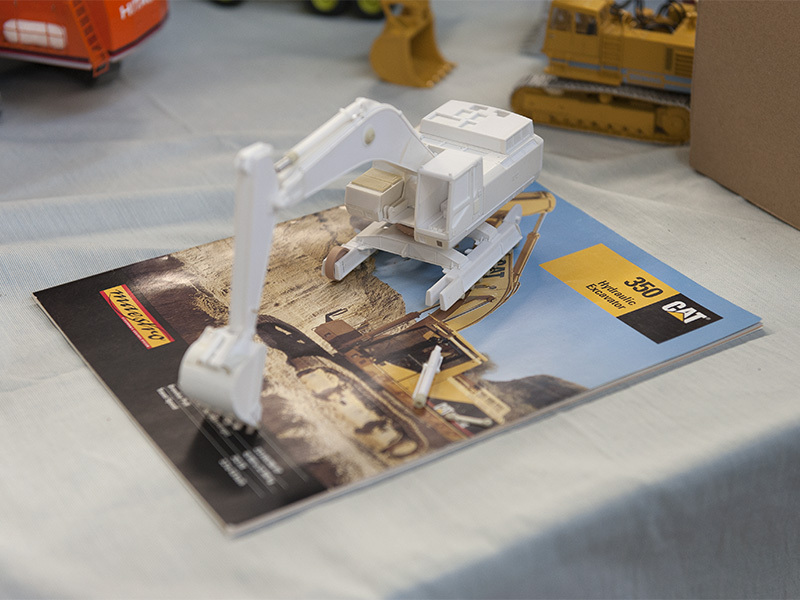 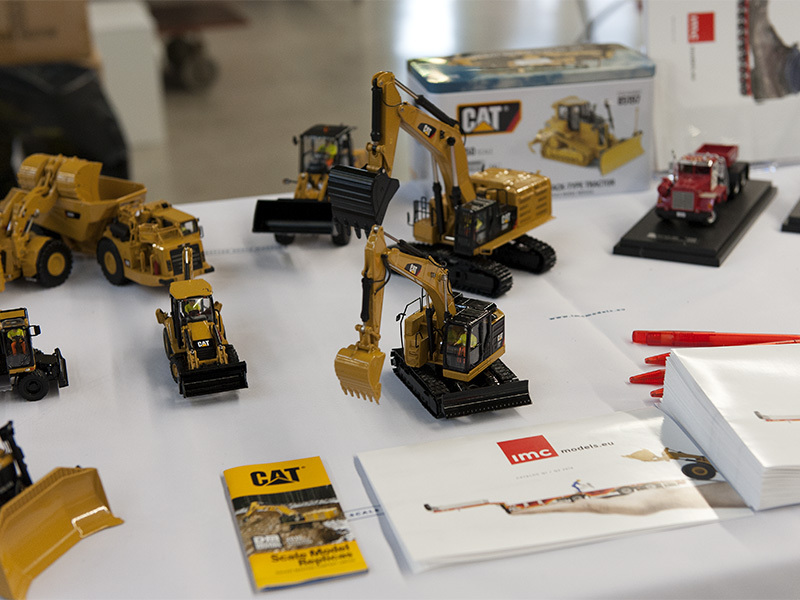 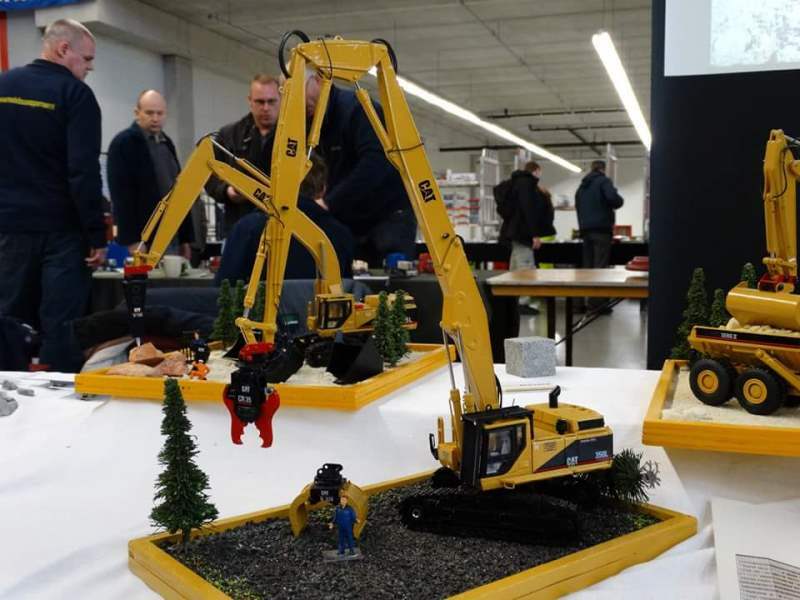 The entire team of IMC Models was present to reveal the latest IMC Models releases and the new Caterpillar scale model line up made by Diecast Masters including the highly anticipated Caterpillar 390F Hydraulic Excavator and the Caterpillar 432F2 IT Backhoe Loader. 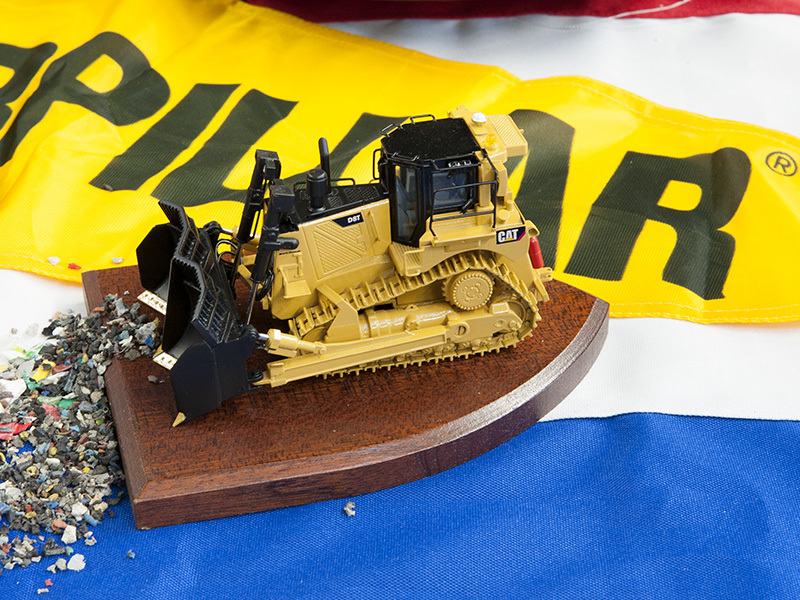 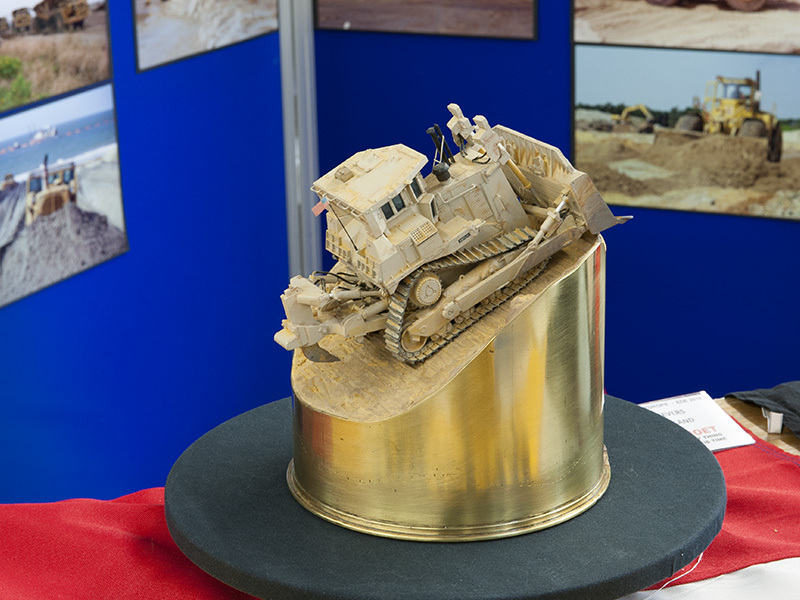 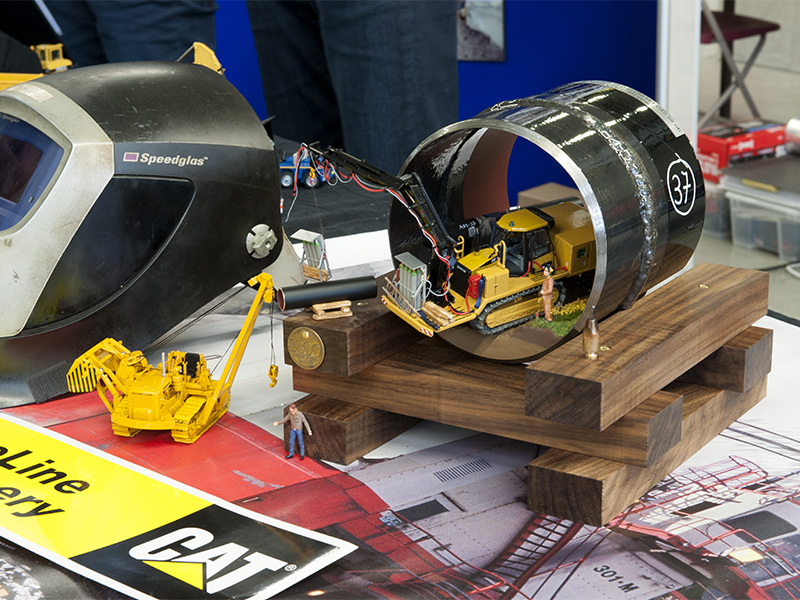 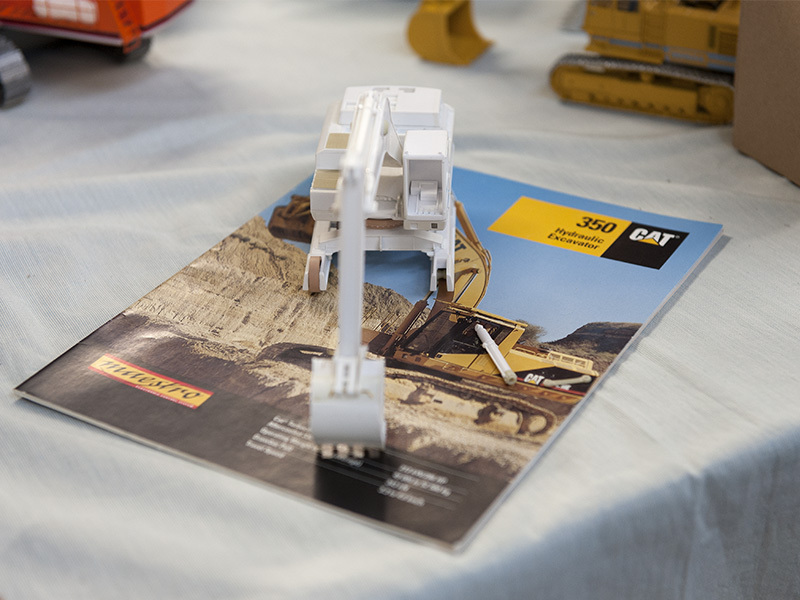 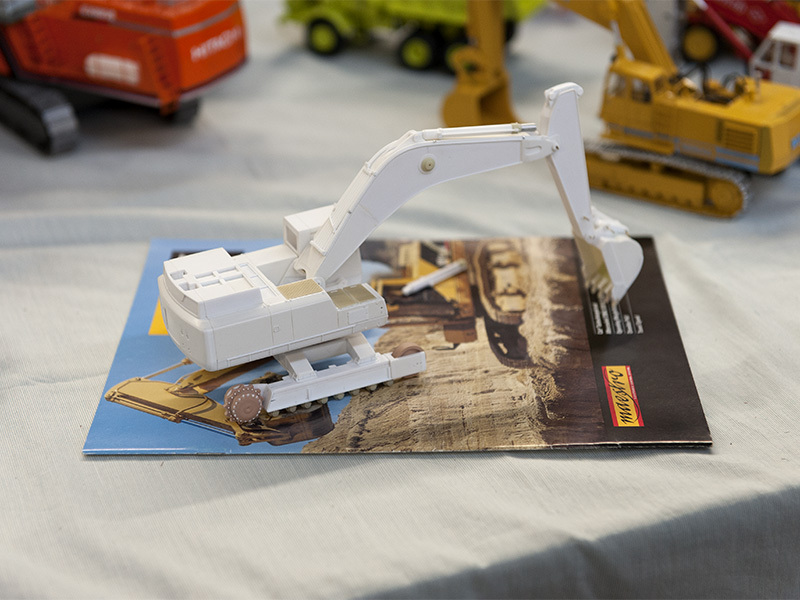 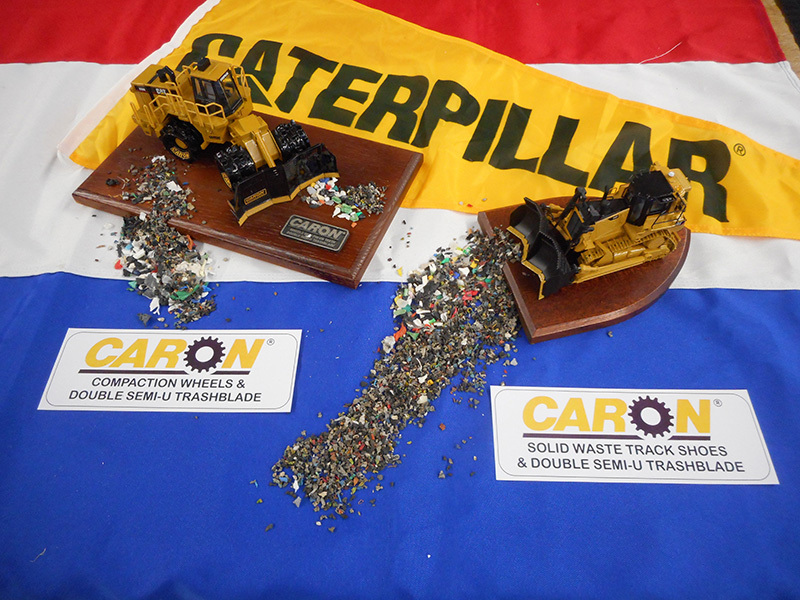 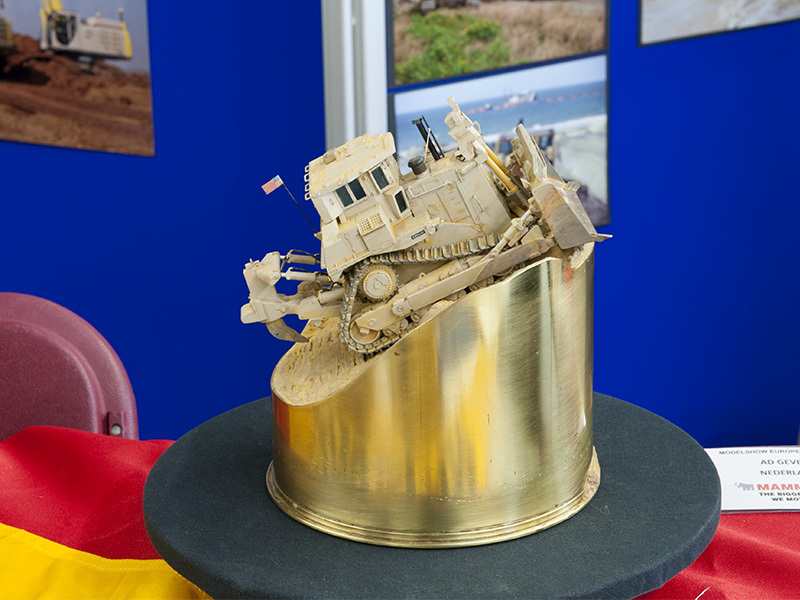 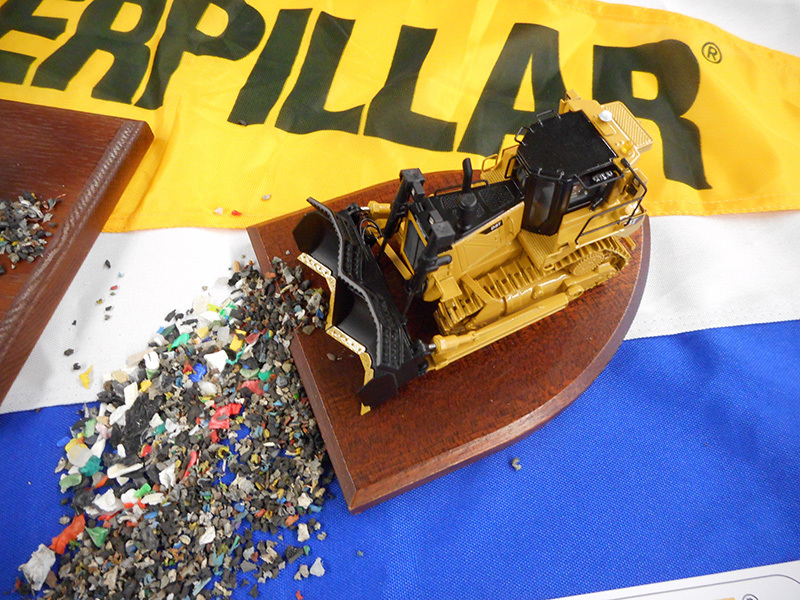 Of course there was (and rightly so) the most attention for the Dutch Scoop of the two prototypes of the Caterpillar D9T Track-Type Tractor and the Caterpillar 335F Hydraulic Excavator at 1:50th scale. 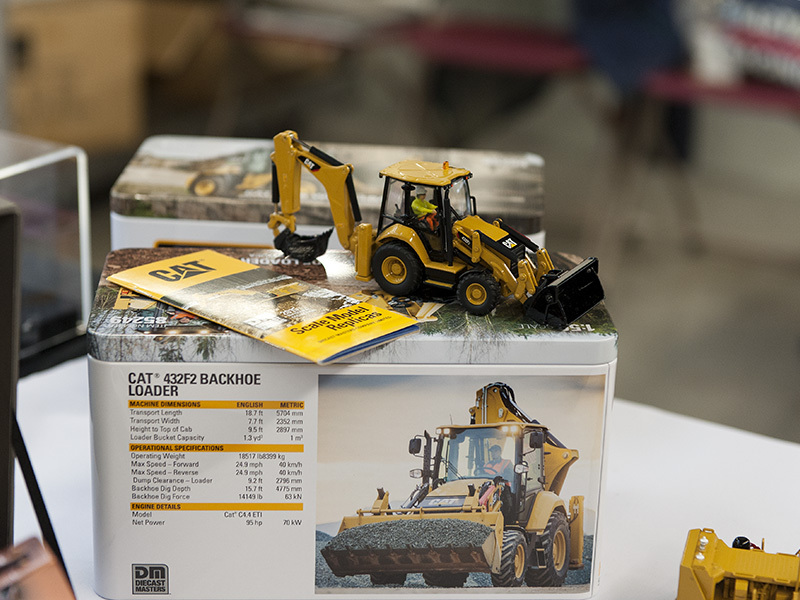 Updates, photos, dimensional details, price, numbers and the delivery schedule date will be posted on our Website when available. 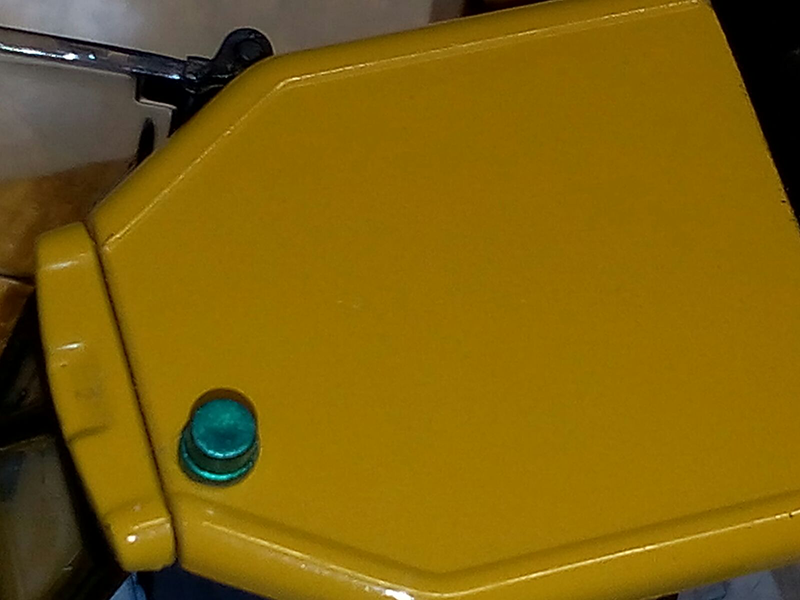 This next knock out model will be available in very limited numbers and made only on request for the collectors. 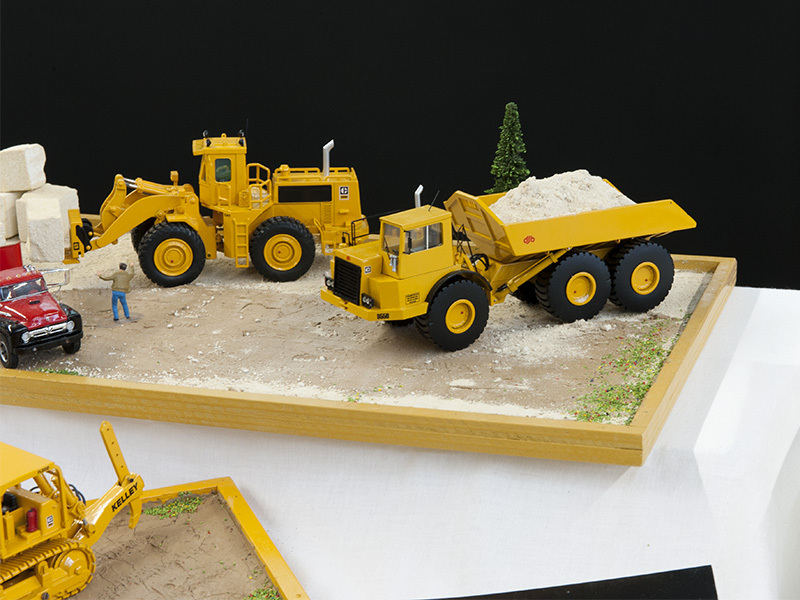 If you are interested in this built scale model it is important to respond with your (pre)order by e-mail to hostmaster@miniaturesdufaubourg.fr. 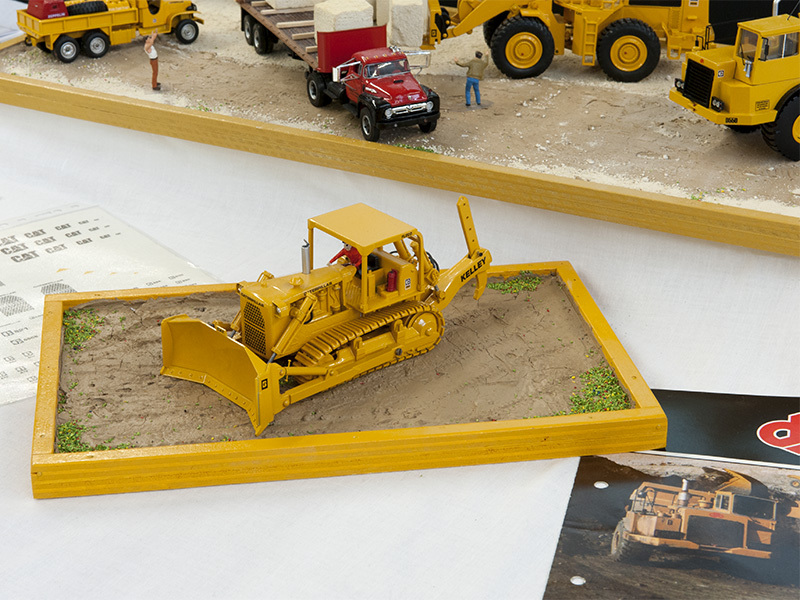 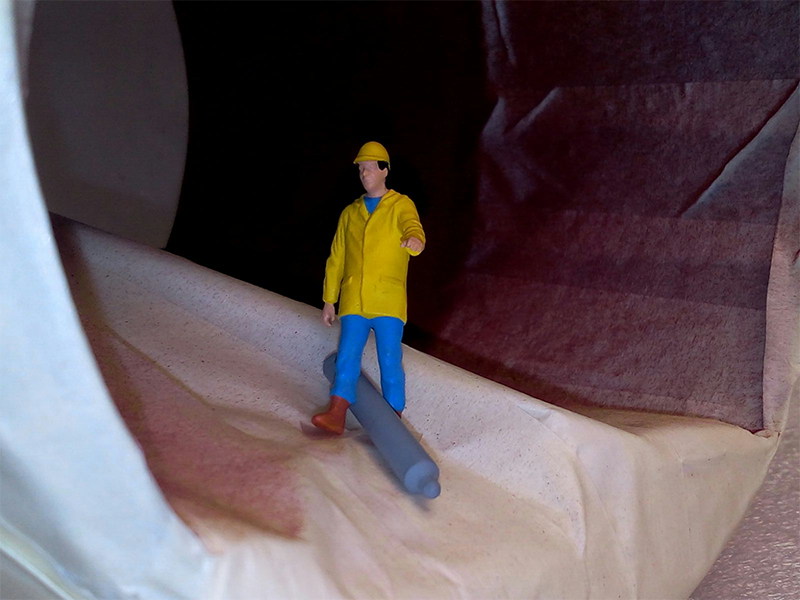 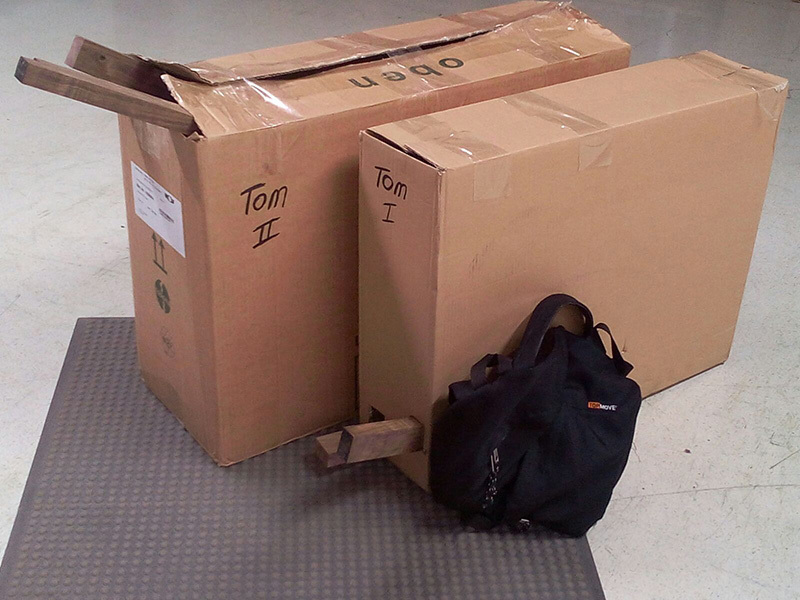 Only then you can be assured that the model is also produced effectively for you. 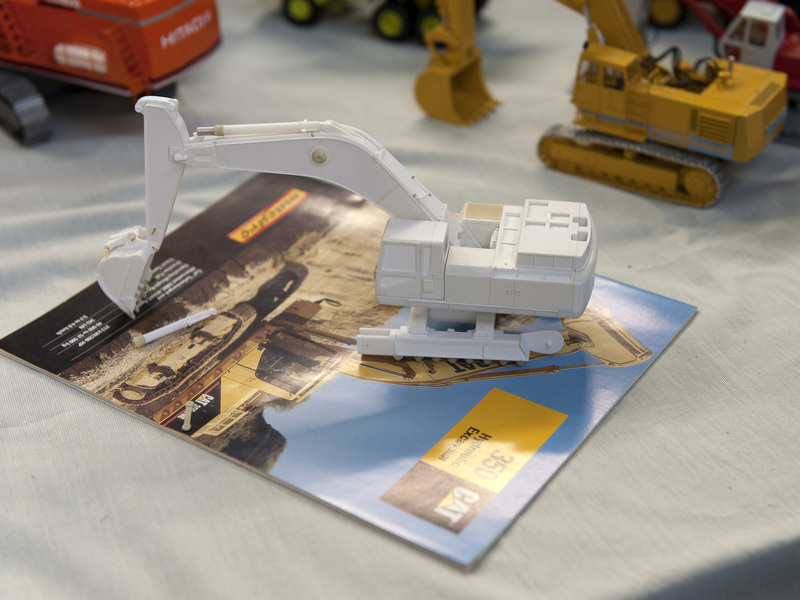 For now, you can now enjoy the first exclusive photos of the development of the master of the Caterpillar 350 Hydraulic Excavator.